Pre-paid phone/e-mail/video support is available. You can contact Doug with a via phone, text, or e-mail and receive a prompt answer via phone, e-mail, or text, or possibly a video with step-by-step instructions. This page includes some "freebies" to give you an idea of the kind of support you can expect from our pre-paid plan. The Super Project Manager add-in for AutoCAD® Electrical, available exclusively from Doug McAlexander, Inc. The Dynamically Paired Source and Destination add-in feature for AutoCAD® Electrical Saved Circuits, available exclusively from Doug McAlexander, Inc. The System-wide Update Block tool for AutoCAD® Electrical, available exclusively from Doug McAlexander, Inc.
1. Develop the basic border drawing for your company. Type ATTDEF at the command prompt to insert attributes. Insert attributes with tag names such as SHEET, TOTALSHEETS, DESC1, DESC2, DESC3, REV, DWGNO, etc., setting such properties as text height, width factor, justification etc. …etc. until you have accounted for every attribute, except SHEET, TOTALSHEETS, DESC1, DESC2, DESC3. 3. 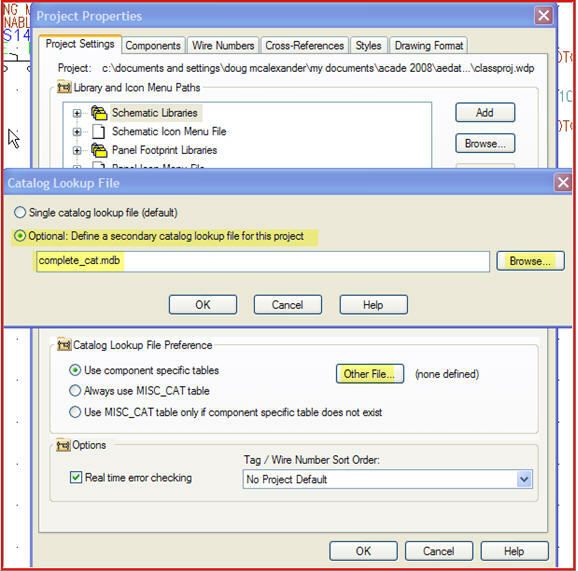 Click the Project menu tab and select Title Block Setup. Choose method 2 and click OK. This method automatically creates a mapping attribute named WD_TB. The data for the WD_TB attribute will be filled in for you in the next step, but will be marked as invisible. The WD_TB attribute value maps the project line label data that you enter from the prompts in the Border_Template_wdtitle.wdl file to the matching attribute in the title block. 4. Click the drop-down arrows next to each Project Line Label prompt and assign select the attribute you want the data delivered to during the Title Block Update operation. Again, do not try to assign anything to SHEET, TOTALSHEETS, DESC1, DESC2, DESC3 yet. That is covered next. 5. Click on Drawing Values button at lower right. From this screen you match up the Sheet (%S) with the SHEET attribute and the Sheet Maximum with the TOTALSHEETS attribute. Then match up Drawing Description 1 with DESC1, Drawing Description 2 with DESC2, and Drawing Description 3 with DESC3. Note: When you perform a title block update the sheet number and total number of sheets, along with whatever text you entered into the three description lines for each drawing, are dropped into the previously determined title block attributes. 6. Save the border drawing as something like D_border_base.dwg for a D-size border drawing. I suggest saving to the Template folder. Hint: The easiest way to find the template folder is to temporarily change the SaveAs Type setting to .dwt. This will automatically switch you to the template folder. Before you save the border drawing, temporarily switch the SaveAs type to .dwg. 7. Click QNEW or File>New and use the acad.dwt template to start a new blank drawing. 8. Click Insert from the pull-down menu, select Block, and browse to the Template folder. Select the previously saved base drawing and insert it at coordinates 0,0,0. Note: Do not check the box to Explode on insert. Once the base drawing is inserted the attributes you placed on the base drawing will not be visible. This is normal. 9. Click the Drawing Properties icon from the Schematic menu tab. Accept the insertion of the WD_M block. This block stores Drawing Properties. Click the Drawing Properties icon from the Schematic menu tab. Accept the insertion of the WD_M block. This block stores Drawing Properties. Click through the various tabs and set design rules, such as Tag, Wire Number, and Cross-reference Format, default Ladder Width, etc. During my Admin plus Workflow Training class we cover this is greater detail. 10. Click Create/Edit Wire Type from the Edit Wire menu. Enter your company's most popular wire types. Note: Don't forget to assign a layer color and line type. Hint: You cannot assign a color or line type until you click in another cell after typing in the wire type information. 11. Insert some wires and components to create a sample circuit, so you can adjust color and line type assignments. As you insert various drawing elements, new layers will be added to the drawing by AutoCAD® Electrical. Be sure to insert a 3-phase component symbol, a location box, and wire numbers. Next click Layer Properties on the Home menu tab and adjust line types and layer colors for the new layers that have been added. For example layer LOCBOX should be set to a line type of Dash Dot to meet IEC61082, or simplay a dash, as is customary in the U.S. I usually use Dash Dot for both IEC and U.S. drawings. The color is usually green or blue. Layer LINK should be set to a dahed line type. Ihave found that linetype Dashed2 usually works for ANSI D-size drawings while linetype Hidden2 usually works for ANSI B-size drawings. Type LTSCALE at the command line and press the Enter key on your keyboard to adjust the line type scale until your dashed line types appear as fine or coarse as you desire. Also consider the color assignment for TAGS, TAGFIXED, WIRENO, WIREFIXED, WIRECOPY, TERMS, etc. 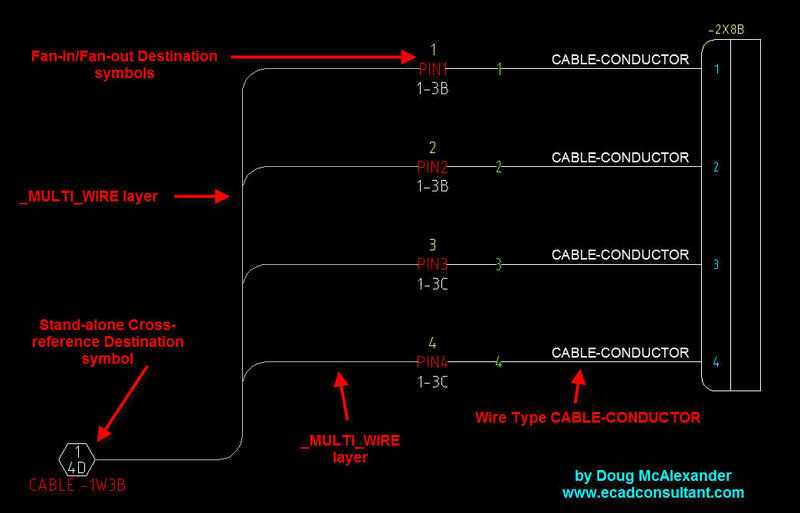 You need to edit at least one wire number and set it to "Fixed" in order for the WIREFIXED layer to be added by AutoCAD® Electrical. Also insert a wire number copy so layer WIRECOPY is added. Edit a component and set the tag to "Fixed" so layer TAGFIXED is added. Go to Layer Properties and set the color for WIREFIXED, WIRECOPY, and TAGFIXED. I use the color RED for fixed layers. Click Configuration on the Panel menu tab and insert the WD_PNLM block. Click Balloon Setup and adjust as needed. Type TEXTSIZE at the command prompt and press enter. Enter your desired default text height and press enter. I also recommend establishing your preferred Publish/Plot parameters in the template. For example, if you want plots to be monochrome, 11x17, centered, zoomed to extents, fit to the paper, etc., enter these parameters using the Page Setup utility. I also recommend setting the default layer to layer 0 (zero) and disabling running OSNAPS. 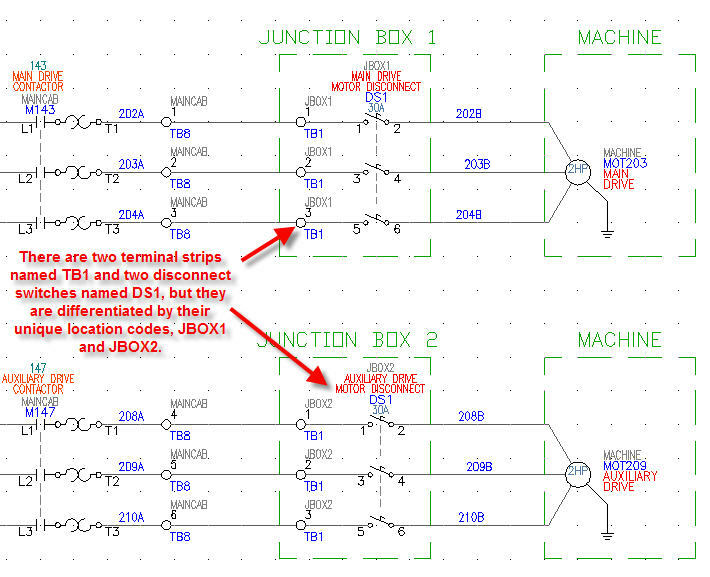 Running OSNAPS can cause problems when editing schematic drawings. I do however recommend setting the drawing to use a pre-defined SNAP, perhaps set to 0.125 for a D-size drawing environment and 0.0625 for a B-size drawing environment, or 1.25mm for an IEC A3 drawing environment. 12. Finally, click File>SaveAs and set the SaveAs type to .dwt for template. Save the file as something like D_border.dwt for a D-size drawing template, or IEC_A4 for an A4-size IEC border. Next save the file as type .dwg inside of the Template folder, in case you ever need to replace or update the border on existing drawings. When you click the New Drawing button in Project Manager set your Template path to the D_border.dwt file or whatever you named your template. Note: You will only need to set the path once. It will remain until you change it. 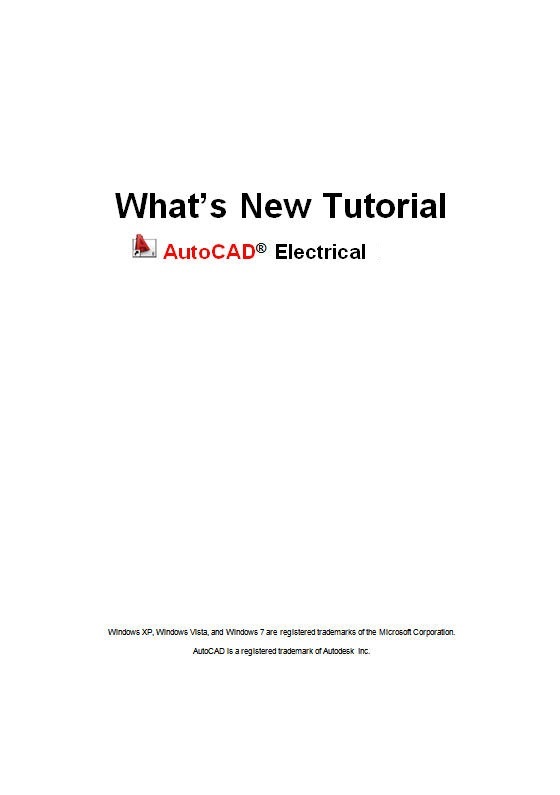 Many people get confused by the fact that AutoCAD "Electrical" has the standard AutoCAD commands available as well. This is because "Electrical", which was formerly known as an add-in program called "Wiring Diagram", installs its tools into the AutoCAD menu structure, so it can make use of the AutoCAD drafting engine. It is not wise to assume that standard AutoCAD commands will produce results that "Electrical" can interpret. Electrical must maintain control of the drafting engine so Electrical can manage the databases that run in the background. The drafting engine doesn't know how to interact with the databases. When you use standard AutoCAD commands you are going off-line and the results could be ambiguous. Sometimes manipulating things with standard AutoCAD commands might work but you have to be familiar enough with the inner-workings of Electrical to know how to manually manipulate the data in such a way that the Electrical data manager can interpret what you did. For example you can use ATTDEF and AutoCAD LT to create symbols that are compatible with Electrical but you must know the proper syntax for the attributes, the symbol naming conventions, etc. However, the Symbol Builder on the Schematic tab of Electrical will act as a wizard and guide you through the symbol creation process such that your symbol is sure to offer the Electrical data manager properly formatted data to work with. You may reason that the only thing that makes a line a wire is the layer name (which must be listed in the Create/Edit Wire Type table), thus you can assign a wire to a different layer by using the standard AutoCAD Layer utilities. This is true, but it will be necessary to select each and every wire segment in the node (a.k.a. wire network), since standard AutoCAD doesn't know how to treat a line segment as a wire, and will not reason that all segments make up one wire. Another example of the superiority of Electrical commands over standard AutoCAD commands has to do with editing a symbol that has already been inserted. A standard rule of AutoCAD is that, once a block is inserted into a drawing, another occurrence of the same block name in the drawing is merely a copy of an existing one. So the second time the same block name is inserted into a drawing, AutoCAD simply copies the one that already exists on the drawing. Why does it do this? The one on the drawing is already loaded into RAM. To load the same block from the hard drive takes additional computing time. This time difference was noticeable with older computers. (I started out with an Intel 286/12MHz computer that had 512KB of RAM.) AutoCAD functioned faster for repeat block insertions by copying the one that was already loaded into memory. So if you made changes to the block after it was inserted into a drawing, the only way to see the changes was to delete all instances of this block, purge the unused blocks, and re-insert the block. You would also need to repopulate any attribute values that were lost. AutoCAD "Electrical" makes this operation quick and easy with the SWAP/UPDATE tool. Competitive electrical design programs that install into AutoCAD and use the AutoCAD drafting engine, turn off all standard AutoCAD functions that they do not control, thereby preventing you from accidentally breaking your drawings or using the long way around to accomplish a task. For example, they may have an icon that looks just like AutoCAD Erase tool, but if you click it, the code is re-routed through their application. Their application prompts you to click on a circuit entity. If you click a wire segment that is left-over from a "T" intersection and is no longer needed, the Erase command trims the excess wire. If you click a wire that is complete and connected on both ends, the entire wire is erased. If you click on a component symbol, the component symbol is erased. This is all done with the same icon. In order for this economic use of menu icons to work, grips are disabled. You must select the command first and then select the drawing element you wish to affect. This is only one of many examples where the electrical add-in program takes over the command structure of the drafting engine in order to dictate a work-flow that will ensure data integrity. Some may not like the fact that all standard AutoCAD commands are not available with the competitive add-ons, thus they would probably prefer the Autodesk version. The makers of AutoCAD “Electrical” decided to give you full use of standard AutoCAD commands, so you have a one-package that fits all of your DWG editig needs. This allows you to edit legacy AutoCAD drawings and mechanical drawings with the same software that you use to create electrical control system wiring diagrams. However by accepting software with this much horsepower under the hood you must also accept the responsibility of knowing when to use which of its many tools. Proper classroom training from a qualified instructor is critical to gaining full use of "Electrical". The Ribbon menu has helped. It is a new user-interface environment that was introduced with version 2010. I was resistant to the Ribbon menu at first but, as an instructor, I quickly realized its benefits for new users. The Ribbon menu can significantly reduce the learning curve for a new user and enforce proper work-flow. For example, the Home tab on the ribbon menu is where you find standard AutoCAD commands, those which can "break" your intelligent electrical drawings if you don't know when and when-not to use them. One rule of thumb that I encourage new users to follow is to stay away from the Ribbon menu's Home tab until they have attended classroom training by a qualified instructor. The Project, Schematic, Panel, Reports, etc. tabs are for electrical functions and they go in order (left-to-right) of the typical electrical design work-flow. You start by creating a project, followed by the schematic, the panel layout, and reports. I also advise new users not to type commands at the command prompt. This will prevent those who are experience users of plain "vanilla" AutoCAD from using commands that might break their electrical continuity. Once they become experienced with the inner workings of AutoCAD Electrical, some manipulation from the command prompt or the Home tab can be acceptable for certain situations. Experienced users of AutoCAD tend to "go home to momma" and use commands they know. After all, the name of the software has the word AutoCAD in it, right? But remember that AutoCAD is merely the drafting engine. The real intelligence lies within the databases and how they "handshake" with the drawing data, the "Electrical" portion of the code. The drafting engine provides the user with visual feedback so the user can see what type of data is being written to the database. Consider the symbols for example. The way they look is important for the user, but not to Electrical. Electrical interprets the attribute values within the symbol blocks, but doesn't care how the symbol is shaped. The appearance of the symbol is for the user's benefit. Thanks to the ribbon interface, you no longer see the standard AutoCAD commands (unless you click on Home), which could damage your electrical drawings and lead to strange results or errors from the project database manager. Unless you intentionally select the Home tab, or type at the command prompt, you are working with Electrical commands that lead to a proper work-flow and provide the database engine with properly formatted data to work with for reports, error analysis, etc. 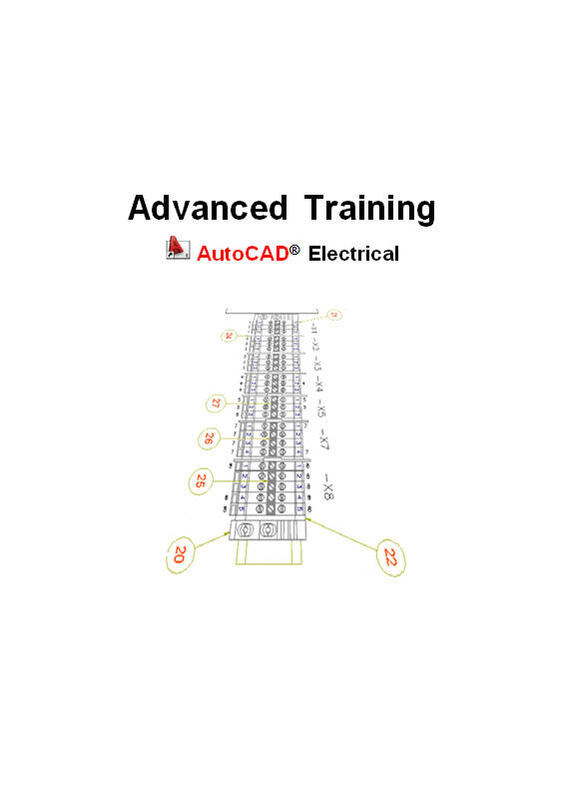 I strongly encourage a new user of AutoCAD Electrical, including those who are intimately familiar with standard AutoCAD, to attend a hands-on, instructor-led training course in order to gain the full benefit of implementing AutoCAD Electrical. But at the very least, upgrade to version 2010 or later and use the ribbon interface, avoiding the temptation to use the Home tab or type standard AutoCAD commands. You may think you don't have the time or money to spend on proper training, but start adding up the cost of the time lost in floundering around on your own, or visiting the Electrical Discussion Group for answers, and I guarantee you that a 4-day training course will pay for itself many times over. Many converts to AutoCAD Electrical are coming from the plain AutoCAD environment, so there drawings usually consist of simple lines and text to represent wires and wire numbers, and simple blocks to represent schematic symbols. They ask me how they might be able to use or convert their existing drawings in order to avoid completely redrawing everything using AutoCAD Electrical. Earlier releases of AutoCAD Electrical included a help section to assist those converting from plain AutoCAD, but this seems to have been removed in the past few releases. 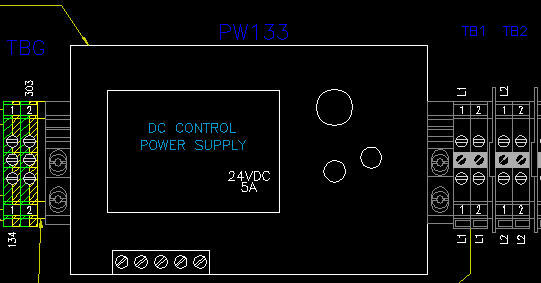 I recommend that you first create the drawing template you will use to create each new AutoCAD Electrical drawing. That procedure is covered here on this page. Then follow the steps below. 1. Create an AutoCAD Electrical project and use the New Drawing button to create a fresh, blank, drawing. 2. Use the Copy with Base Point utility from plain AutoCAD to copy and paste the circuit from plain AutoCAD into this fresh, blank, drawing. 3. 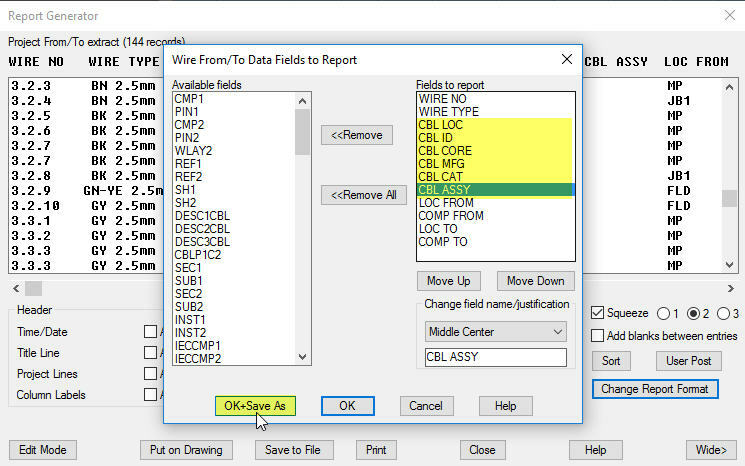 From the Conversion Tools menu tab click the Change/Convert Wire Type button and convert the lines that represent wires into wire type layers you defined in your AutoCAD Electrical drawing template. Once the non-intelligent lines have been assigned to intelligent wire type layers they can be managed completely by AutoCAD Electrical. 4. If your old drawing contained ladders, use the Convert Ladders utility to convert the plain text line reference numbers (a.k.a. rung numbers) into intelligent numbers that AutoCAD Electrical can track and manage. 5a. 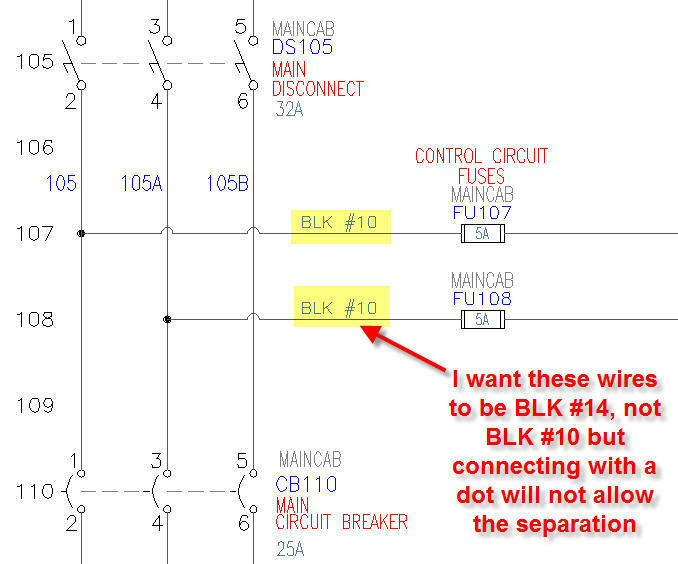 Use the Block Replacement utility to swap symbol blocks from the old drawing for those recognized by AutoCAD Electrical. Click on Block Replacement and choose Drawing (all). Type in a name for the spreadsheet. The utility will create a spreadsheet with the first column filled in with the block names of the symbols that were pasted in from the plain AutoCAD drawing. 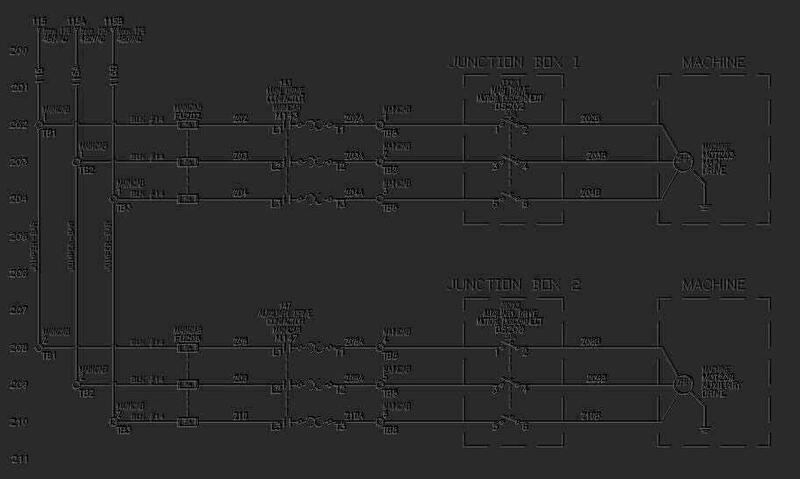 Fill in the second column with the block name of the AutoCAD Electrical symbol you wish to switch to. 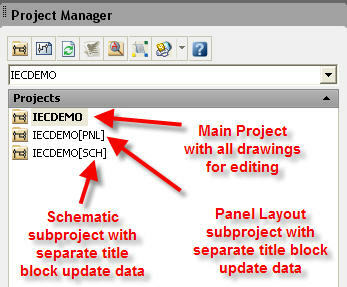 Note that the blocks will be inserted from whichever schematic symbol library you defined in Project Settings. 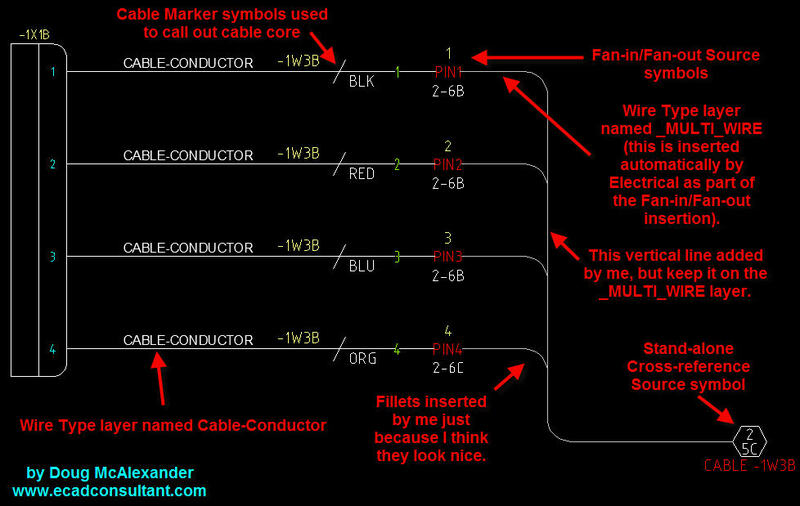 If you are new to AutoCAD Electrical you might not be familiar with the block names for the symbols. Just open the Icon Menu and hover your mouse over the symbol you wish to use and the block name will appear as a popup. Type this block name into the second column of the spreadsheet that the Block Replacement utility created. After you have typed in the replacement block name for each old block, save the file. Click to run the Block Replacement utility again. This time you will notice that the utility allows you to select the previously-saved spreadsheet. Select it and click Save. I know that clicking Save makes no sense but Autodesk just chose to use the same dialog box for both creating the spreadsheet and initiating the replacement process. Hint: The Project option can be used if you have already created every drawing you need and you have already copied with a base point the non-ACE compliant drawing data into each of the new drawings. 5b. You can alternatively swap one block at a time using the Convert to Schematic Component tool, which is also located on the Conversion Tools menu tab. Note that there is s drop-down arrow on this button that includes options to convert signal arrows to intelligent Source and Destination symbols. 6. Use the Convert Text to Wire number tool to convert any existing text-based wire numbers to smart wire numbers. 7. 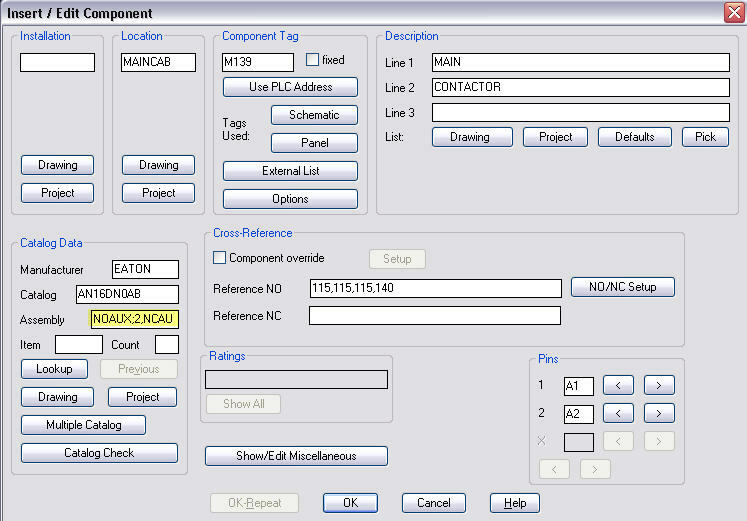 There is a Stretch Wire utility included on the Conversion Tools menu tab, in case some of the intelligent replacement symbol blocks are smaller than the originals and thus the wires did not completely attach to their respective wire connection attributes. This is a broad overview of the procedure that I teach my students, but this will get you started. Once these conversion are made you can begin "tweaking" and detailing using AutoCAD Electrical commands, such as assigning catalog numbers using the Edit Component tool, Scooting a component along a wire (in case the new ones are larger - resulting in crowding), and more. Quite often I need to assign a different document number to the various types of drawings in a project. For example, the schematic must be a unique document number with unique data in the title block, including page numbering that applies only to the pages that make up the schematic. I must also have a unique Document Number, Drawn By, Checked By, etc. for the panel layout, the wire list, and the bill-of-materials. After all, on a large scale project, these might each be created by different designers. But I still need the intelligent connectivity between the schematic, panel layout, wire list, and BOM for editing purposes, and for a "global" view of the entire project. This can be accomplished within the Project Manager of AutoCAD® Electrical without any custom programming. Create your master project with all necessary drawings, as usual. Next create another project for schematic drawings only, placing its respective .WDP file inside the same folder as the master project.WDP file. Hint: Keep all drawings in the master project folder. 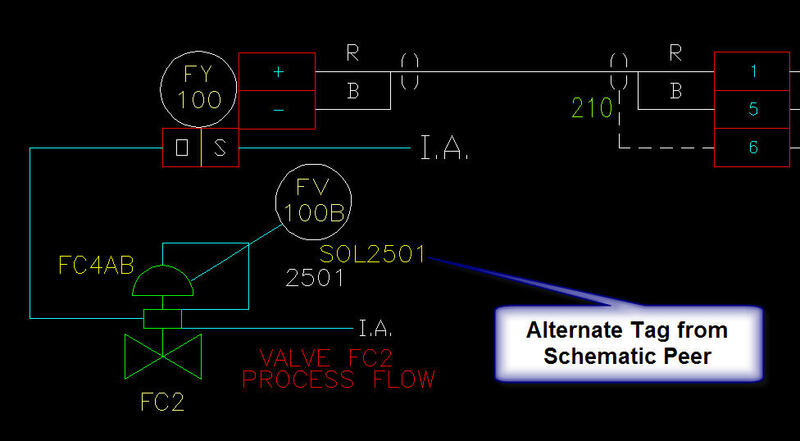 Right click the schematic only project and select Add Drawings. Add only the schematic drawings to this project. Repeat this procedure again for the panel layout, and again for the wire list, and finally for the bill-of-materials. If you work with sub-projects on a regular basis, you may be interested in a utility we sell, called Super Project Manager. Start the Super Project Manager and you are given a dialog that allows you to create sub-projects and select the drawings for each with one easy-to-use interface. These projects are then automatically added to the Project Manager. In the following screen shot you see the Super Project Manager interface. I have created two sub-projects and assigned their respective drawings. Drawings 1 through 22 are assigned to sub-project 1, the schematic, denoted as [SCH], while the remainder of the drawings are assigned to sub-project 2, denoted as [PNL] for panel layout. The Super Project Manager places the new project title inside brackets and appends this to the master project's name to create the sub-project name for you. For this illustration I have called my sub-projects SCH for schematic and PNL for panel layout. They could just as easily have been named for document numbers. In the next screen image you will see the master project that already existed and the two sub-projects that Super Project Manager added to Project Manager. I can edit the entire project using the master project, for bi-directional updates, project-wide operations, etc. But I also have a separate project for the schematic which allows me to enter different project line label information and run a separate title block update, so the schematic can have unique page numbering, a unique document number, and unique description text. The same is true for the panel layout. I can also create sub-projects for the wire list, bill-of-materials, etc. and do the same for them. 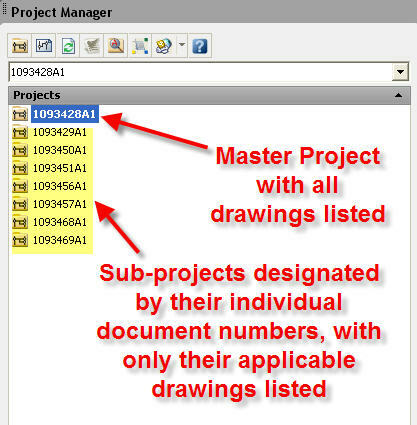 You might also use the Super Project Manager to divide a project that contains hundreds of pages into smaller groups of drawings so the amount of data that the project manager must manage is trimmed to only the pages I need to modify. Each sub-project will have its own dedicated database which will only need to track changes to the limited number of drawings in the sub-project. Note: You can reference the same drawings in more than one project, so all sub-project drawings can also stay listed in the master project. Changes made to the sub-projects will automatically appear in the master project. The Super Project Manager allows you to manage very large projects efficiently without giving up the reliability of a drawing-driven electrical CAD program. The attraction of database-driven electrical programs is their speed when dealing with a large number of drawings. The drawing data is stored in a database and drawings are only refreshed when they are opened for later viewing or printing. This reduces the amount of time the program must spend updating drawing files. However if the database crashes, hours of work could be lost before it is written to the affected drawings? Of course the downside to a drawing-driven approach is that the drawings must be updated in real-time since the data is stored in the drawings themselves. Each time an edit is made that affects other drawings the user must await the real-time update, or append it to a running task list that can execute all updates at once, perhaps during a coffee break or lunch break. The Super Project Manager will allow you to work at sub-project level, dealing with fewer drawings and speeding up the real-time processing. Changes made in the sub-project(s) are automatically visible in the master project. Since the data is stored at drawing level, the master project's database will detect the changes made to the drawings at sub-project level. So the Super Project Manager allows for a best-of-both-worlds approach to electrical CAD. When you share the vendor catalog (default_cat.mdb) across a network it is normal to experience a slower response time when performing a part number Lookup. This is due to network traffic/latency. The search-interval, or seek-time, for a part Lookup is also affected by the size of the default_cat.mdb file. The more manufacturers you select during the installation process, the larger the default_cat.mdb file, resulting in a slower seek-time. There is an alternate method you can use if you would like to have access to all manufacturers from time to time but would also like to work from a smaller "preferred" list of manufacturer parts. First, make a copy of the default_cat.mdb file (normally located in the Catalogs folder) and rename the copy to complete_cat.mdb. Next use MS Access® to edit the default_cat.mdb and remove all manufacturers and/or part numbers you will never use. If you never use AB, then remove AB parts from all component tables (i.e. CR, LT, SS, PB, etc.). Note: If you know you will never us AB parts, do not select the AB checkbox from the manufacturer's list when installing AutoCAD® Electrical. Only check the boxes for the manufacturers you will actually use. Once the catalog database is trimmed down to only your preferred manufacturer parts the seek-time for a Lookup will be less. The next thing to do is to right-click on your project name and select Properties. Click the button labeled "Other", then click on the radio button labeled "Optional: Define a secondary catalog lookup file for this project." Browse to the complete_cat.mdb file. OK out of all the dialog boxes. With the "trimmed down" default_cat.mdb you should experience a faster response when performing a part number Lookup. 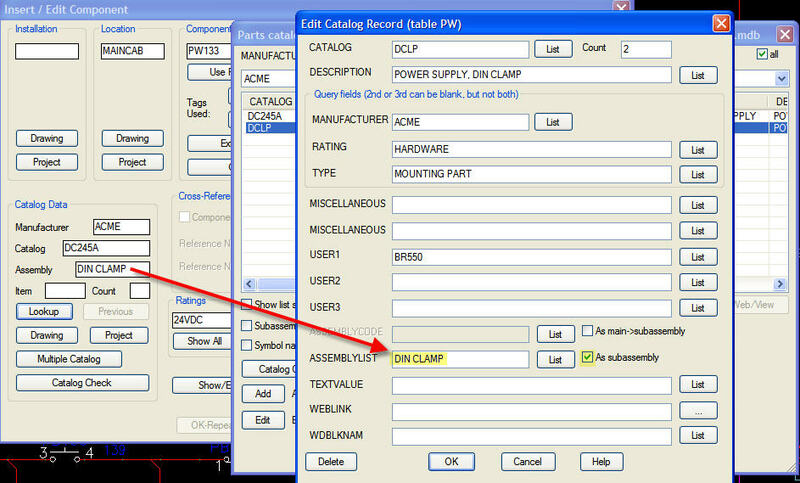 Anytime you need a part number from the complete catalog, click the "Other" button from within the Lookup dialog (version 2010 and previous) and follow the prompts to temporarily switch to the complete catalog. 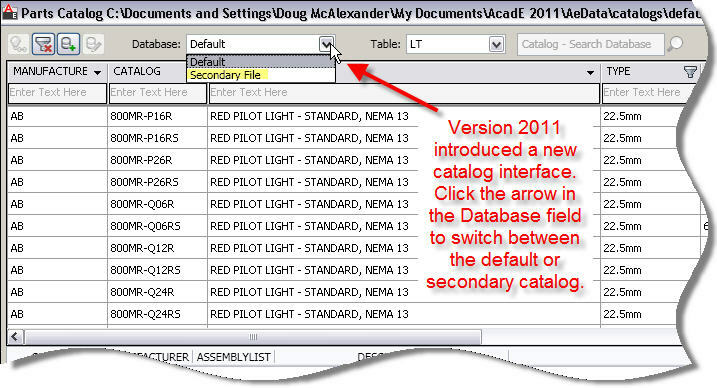 For version 2011 or later click the arrow in the field labeled as Database and select the Secondary File. Version 2011 of AutoCAD® Electrical includes significant enhancements to the part number (a.k.a. catalog) Lookup tool. When you click Lookup you will see that the top left box under Catalog is blank. Click in this box and start typing a part number. The results in the window below will begin to narrow down according to what you type in. You can perform similar filtering for other columns, such as Description, Miscellaneous, etc. You can drag and drop fields left or right to order them according to your needs. You can also right-click above any field name and uncheck the box for any fields you wish to hide. Hint: You can also type a portion of a part number into the Search Database field using an asterisk (*) for a wildcard. Then click the magnifier icon to begin the search. This will search across family tables so it is possible to select a part from the TRMS (terminals) table and assign it to a fuse, for example a fuse holder style terminal. AutoCAD® Electrical obtains some of its functional rules from simple text files called support files. Most of the files are discussed in detail in the Help system built into AutoCAD® Electrical. The fact is that some files can be located in more than one location, depending upon the user. For example, the main parts catalog is the default_cat.mdb file, located by default at My Documents\AcadE 2008\Catalogs. You could copy this file to a specific project folder and rename it to _cat.mdb, then make modifications as necessary for the specific project. For example, let's say you want to delete all but the preferred suppliers for each type of component. You could take a similar approach with the default.wdw file, normally located at C:\Documents and Settings\Doug McAlexander\Application Data\Autodesk\AutoCAD Electrical 2008\R17.1\enu\Support\User. Move this file to a specific project folder and modify as necessary to force the naming convention for wire color/gauge labels. Another file in the User folder that might be modified for use with a specific project is the default_wdtitle.wdl file. This file controls the project line label prompts that you see when you right-click on a project name and select Descriptions. The one that installs by default will most likely need to be modified to meet your needs. If you use different title blocks, perhaps customer-specific, you may need to place a _wdtitle.wdl file in the specific project folder so the project line label prompts coincide with the title block for that project. If you choose to use the User Defined Attributes functionality AutoCAD® Electrical will create a .wda file in the folder of the active project. The WDA file stores a list of custom attributes you may have added to some blocks and that you wish to make available for reports. 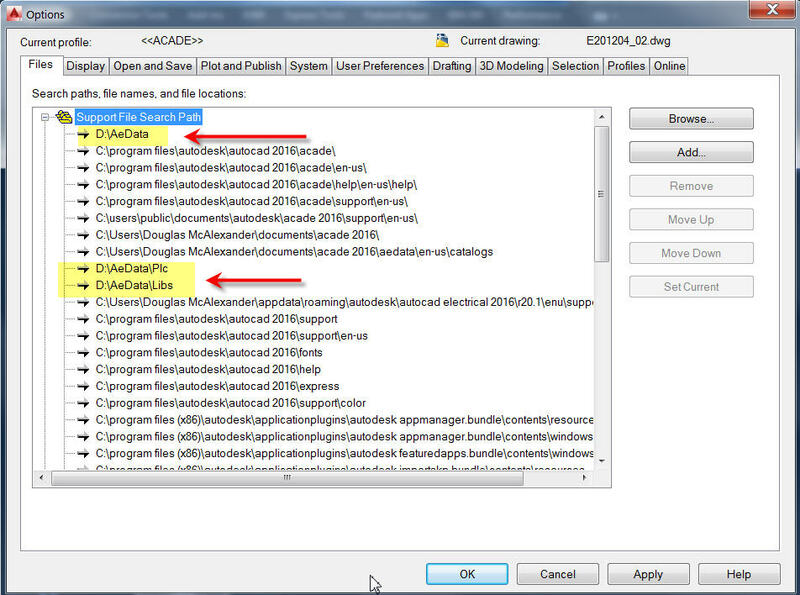 The bottom line is that AutoCAD® Electrical looks first inside the project folder for these files before it will use a default file from the User folder. During a project copy you will see a list of support files that AutoCAD® Electrical will search for. If any are found they are checked by default, assuming that you will want to copy them as well. You can uncheck if you wish not to copy the project specific support files. According to the list above, selector switches (SS), push-buttons (PB), limit switches (LS), and thermal switches (TS), will all be tagged as S, in complaince with IEC/ISO-81346. Note: The wd_fam.dat file is functional during component insertion and during retag operations. AutoCAD® Electrical does not interpret the graphical appearance of a symbol. The data stored in various attributes within the symbol gives AutoCAD® Electrical the information it needs to interpret what kind of symbol it is and what to do with it. The POSITION attributes hold the text value that you can assign to the various positions of a selector switch. Position 1, POS1, might be designated as Manual while Position 2, POS2, might be designated as Auto. When you insert a selector switch you will see the fields to type the text into at the lower right, near the pin assignment fields. The STATE attribute allows you to enter the text string that indicates the state of the switch in various positions. The letter "O" indicates open while the "X" indicates closed or connected. The PINLIST attribute can be filled automatically from the Pin List Database (provided there exists an entry for the particular MFG and CAT combination). You can optionally click the NO/NC Setup button while editing the parent or coil of a relay or contactor and enter the pin list. The syntax is explained on the dialog. Basically you enter the contact type (i.e. 0 for convertible, 1 for NO, 2 for NC, or 3 for Form-C), followed by a comma followed by the first contact terminal or pin assignment (i.e. A1X), followed by the second contact terminal or pin assignment (i.e. A1Y), followed by a a semicolon as a delimiter to start the next group. So a syntax of 0,A1X,A1Y;0,A4X,A4Y indicates the relay has two convertible contacts with one designated as terminals A1X and A1Y while the other is designated as A4X and A4Y. 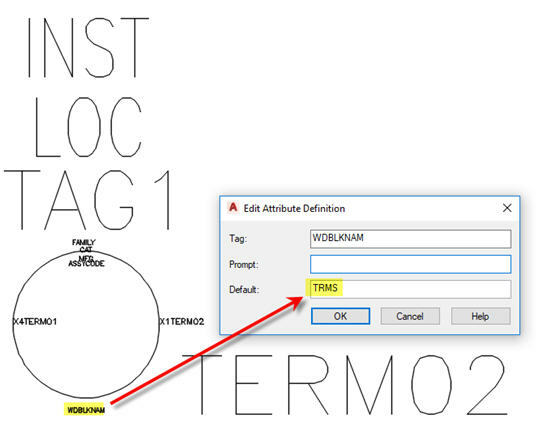 The WDTAGALT attribute is used to connect symbols that appear on two different design peers. For example the solenoid symbol for a schematic looks different than the solenoid symbol for a pneumatic drawing. In the example screen image the solenoid symbol on the schematic has a TAG value of SOL2501 and a WDTAGALT value of FV100B. This signifies that the solenoid has a cross-peer symbol tagged as FV100B that is the pneumatic equivalent symbol representing the same solenoid. The pneumatic symbol would have a TAG value of FV100B and a WDTAGALT value of SOL2501. This peer-to-peer relationship tagging indicates that two different symbols represent the same device. 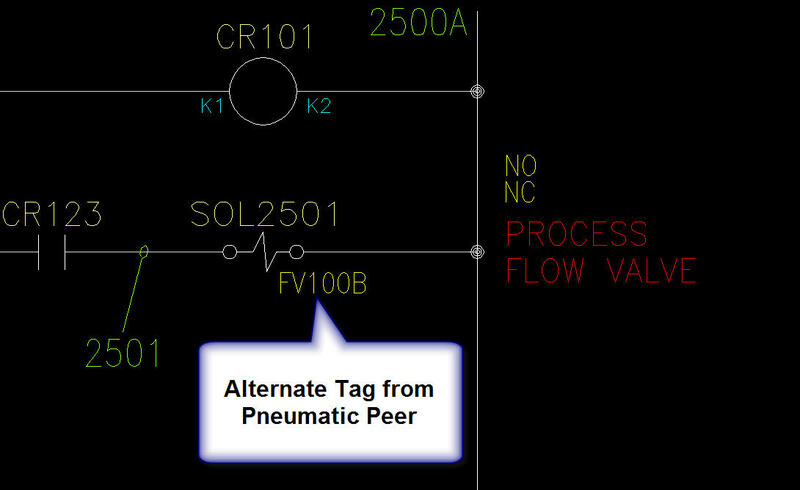 There is a method for creating these peer-to-peer tags in the Electrical Helps under Advanced Productivity, but you can simply click the Show/Edit Miscellaneous button on the Insert/Edit dialog of a solenoid or pneumatic valve symbol and enter the tag name for the related symbol directly if you wish. Allow me to clarify one issue that has confused many of us. It involves the WDBLKNAM attribute. You don't normally need a WDBLKNAM attribute to send the Lookup command to the appropriate table for schematic symbols, such as the CR table for a control relay. The Lookup operation looks at the 2nd and 3rd character in the symbol file name to determine what table to look in. If you wish to override this and direct the Lookup to open a different table, you can enter the alternate table name in the WDBLKNAM attribute, preceded by an underscore. Note: Earlier releases of AutoCAD Electrical® ignored the first character in the WDBLKNAM attribute value so we had to enter some value as a placeholder. I used the underscore character. Hint: The WDBLKNAM attribute is very helpful for the footprint symbols because their symbol file names don't coincide with the same naming convention as the ones for schematic symbols. Footprint file names can be just about anything that makes sense to you. I tend to name them for the manufacturer and part number, but it is your decision. 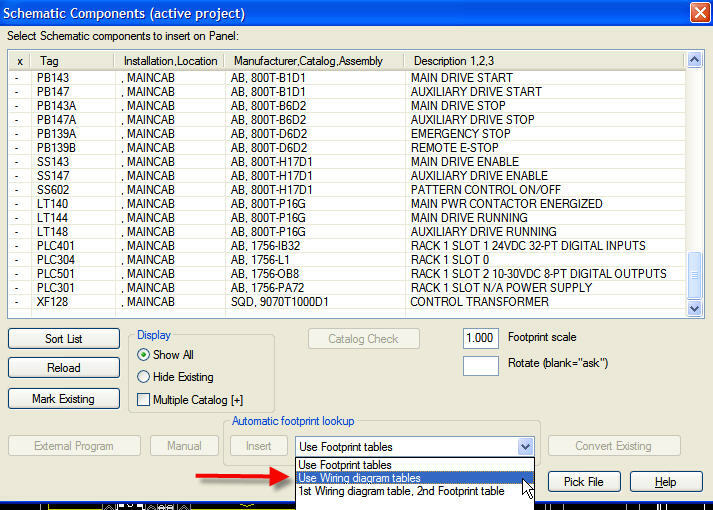 If you insert footprints from the Schematic List, the catalog assignment comes from the schematic symbol. 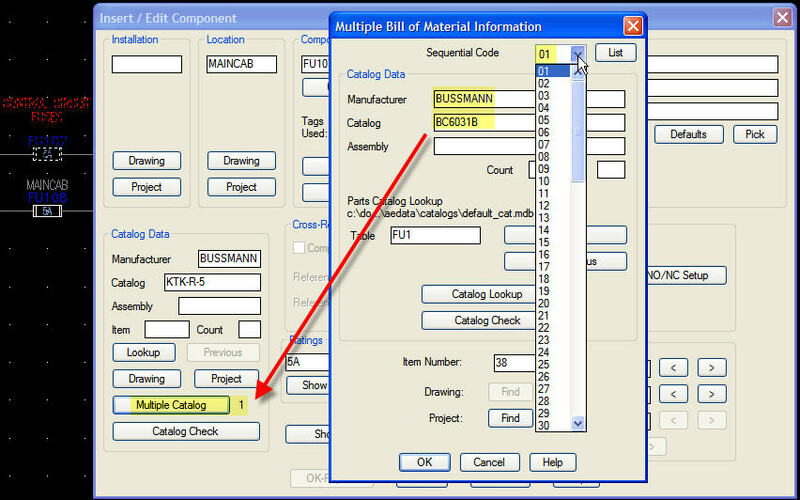 If the catalog data was not assigned at schematic level, or if you are laying out your panel first, the Lookup will bring up the complete list of tables and you will need to select the appropriate table. But if you add a WDBLKNAM attribute and set the value to the appropriate table the Lookup will go straight to the table. Note: Don't get the WDBLKNAM attribute in symbols confused with the WDBLKNAM field in the catalog database records. The WDBLKNAM field in the catalog database is used by the Symbol Name Filtering function. 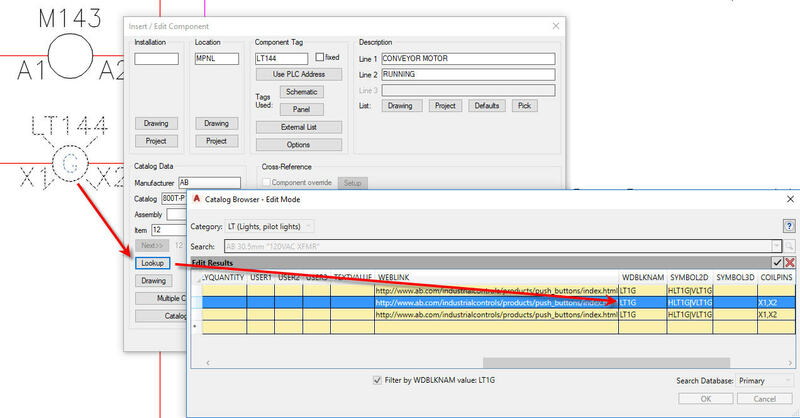 With the Symbol Name Filtering box checked on the Lookup dialog (default setting) AutoCAD® Electrical searches the catalog records for WDBLKNAM entries that match the symbol file name, minus the first character and minus the file extension. If found, AutoCAD® Electrical offers only the record or records that match the symbol name, minus the leading H or V and minus the file extension. For example, let's say your favorite control relay is AB 700-P200A1. Click Lookup and find the AB 700-P200A1 record. Click in the WDBLKNAM field and enter CR1, which is the last portion of the file name for the standard control relay coil symbols (i.e. HCR1 and VCR1). 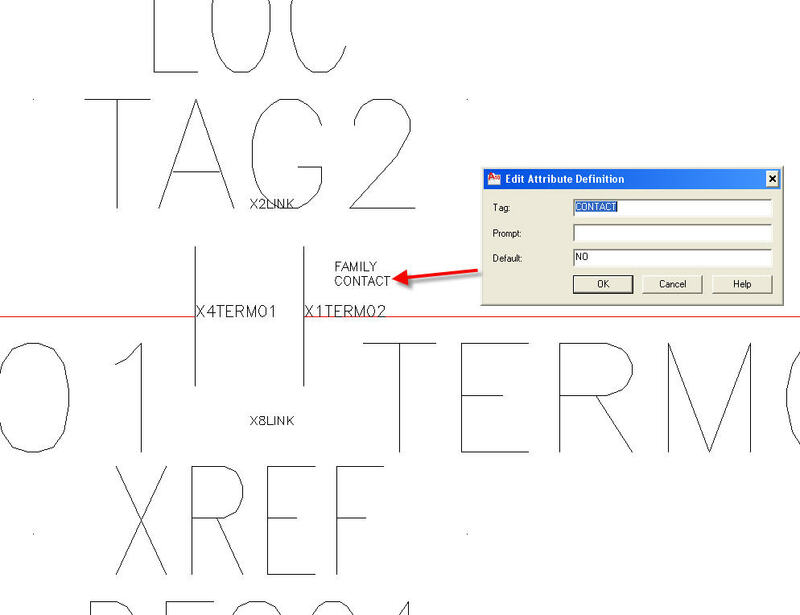 The reason you do not need to enter the H or V is because the first character in a symbol file name indicates vertical or horizontal wire connections, which has no bearing on part number searches and assignments. 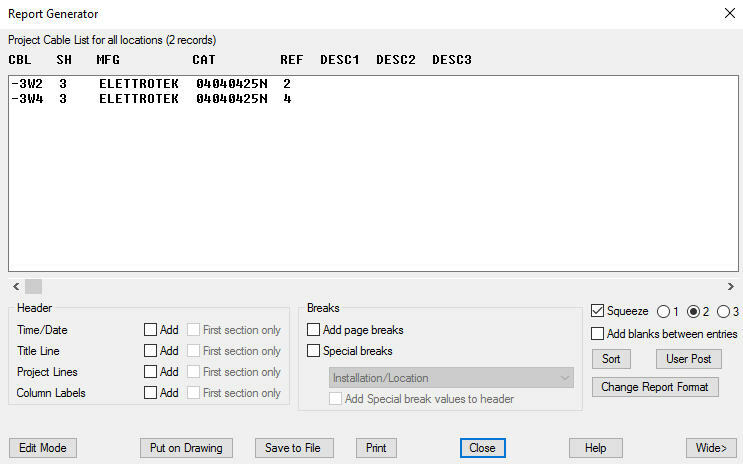 So by entering CR1 into the WDBLKNAM field of the AB 700-P200A1 record you instruct the AutoCAD® Electrical Symbol Name Filtering to jump straight to the AB 700-P200A1 when you click Lookup from the Insert/Edit Component menu for either symbol block HCR1 or VCR1. You could use this feature to zero in on your favorites for all types of symbols. Note: I noticed a few years ago that the WDBLKNAM filtering started including records with a blank WDBLKNAM field, as well as the ones where I made an entry with a block name. So all fields must be filled in with some block name value or this function will not actually help filter to only your favorites. You will need to make entries for every part number in the table and assign it the letters and numbers of the block name it should be associated with, minus the leading H or V, and without the .dwg file extension. I posted a request to the AutoCAD® Electrical Idea Station, asking to correct this. Please click on the URL below and Vote Up my request. Suppose you have a contactor that is available with or without aux contacts. There are two ways to approach this. You can simply enter the L1/T1, L2/T2, and L3/T3 pins in the Pin List Database and consider the auxiliary contact pin numbers as something you assign manually when used. Or you might permanently add the aux pins to the end of the Pin List for the contactor, making them automatically available as needed, as illustrated in the following screen shot of the Pin List Database edit dialog. 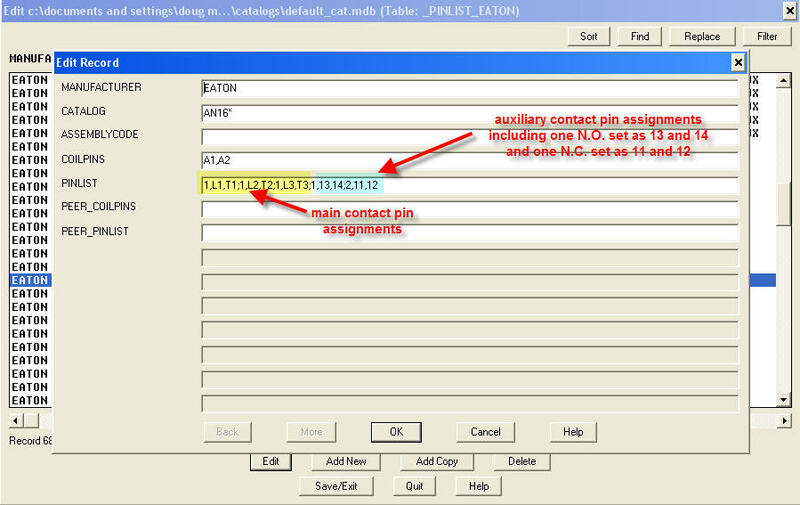 The illustration below shows how to edit the pin assignments in the Catalog Browser, starting in release 2015. But let's just say I only use the auxiliary contacts infrequently and thus I only have the main contact pin assignments entered into in the pin list database. Later I decide I must add a N.O. aux contact designated as pins 13 and 14. First I edit the coil symbol and add the part number for the auxiliary contact to the Multiple Catalog list, so it would be included in the BOM. I then click the NO/NC Setup button and add ;1,13,14 to the end of the pin list. That is a semicolon followed by the number 1 for N.O. then a comma with no space and a 13 followed by another comma with no space and a 14. The complete NO/NC Setup then appears as follows: 1,L1,T1;1,L2,T2;1,L3,T3;1,13,14. I am now ready to insert the N.O. auxliary contact and pin numbers 13 and 14 will be available. Note: The syntax for a N.C. aux contact with pin numbers 11 and 12 would be ;2,11,12 with the number 2 designating normally-closed. Suppose you have a contactor that you sometimes add a normally-open auxiliary contact to, or a normally-closed contact, or both, on an as-needed basis. Enter an assembly list value of NOAUX in the record for the NO aux contact. Enter NCAUX for the assembly list value of the NC aux contact. Don't add the assembly code to the main part in the catalog database. You will enter it "on-the-fly" as needed. When you insert or edit the main part, type in NOAUX in the ASSEMBLYCODE field if you want a NO aux contact added, type NCAUX if you want a NC aux contact added. Type NOAUX;NCAUX into the ASSEMBLYCODE field for the main part if you want both. You can even add a quantity if you prefer more than one of either. For example, NOAUX;2,NCAUX will get one NO aux contact and 2 NC aux contacts. I like playing with assembly codes. We explore all options in my training to cover the various scenarios, such as with this contactor scenario. A sample screen shot from my training course is attached. I have my own way of using Fan-in/Fan-out to document cables and cable cores. I document the cable cores and then sum into one line, passing the cable to another page and breaking it back out again into individual cable cores. The Fan-in/Fan-out supports my method, but my particular workflow isn't covered in Help. First, insert the wires that will be summed into one line. You can assign them to a specific wire type layer as desired, but if they will be summed into a cable, I recommend creating a wire type called Cable Conductor and assign the wires to this layer/type. When you insert cable markers, they will define the cable core color or number. You can insert the cable markers either before of after you insert the fan-in/fan-out source or destination. After the fan-in/fan-out symbols are inserted, the wire type on the side that will be summed into one line will be assigned to layer _MULTI_WIRE. Connect these _MULTI_WIRE segments to one plain drafting line and assign this line to layer _MULTI_WIRE. You can use a Fillet at the join point if you wish. Hint: You can use Match Properties to copy the layer assignment from one of the _MULTI_WIRE segments. If the _MULTI_WIRE must break and continue at another location, use Stand-alone Cross-references at the break points, because standard Source and Destination arrows will not function with the _MULTI_WIRE layer. The attached screen shots, from my advanced training course, illustrate my method. Cable marker data appears in a cable summary report. You access the Cable Summary Report from the Schematic Reports list. A Cable Summary Report will include basic information about the cable but no details. Once you move the fields into your report, you can rename them as desired. Be sure to save the format so you can use it over and over again. The wire from/to list below includes cable data with the fields renamed. 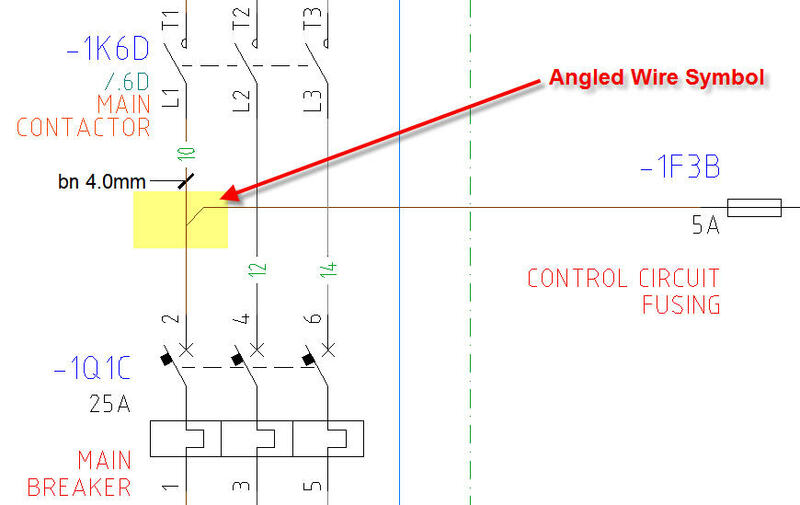 The angled wire tee symbol in AutoCAD Electrical serves two purposes. Starting with version 2008 the angled wire symbol orientation clears up the ambiguity on the print and also dictates the wiring sequence on the wire from/to list. The orientation you select by pressing the spacebar on your keyboard when inserting or toggling an angled wire symbol also tells the wire from/to list generator exactly how you want the wires at this node connected. So you wish to create a power bus by installing a jumper-bar down the middle a terminal strip. The following is the method I have used since 1997 and it works perfectly. It has been further enhanced since the introduction of the Terminal Strip Editor (a.k.a. TSE). This method applies to either vertical or horizontal power rails. In this example I will use a standard ladder diagram. Insert the ladder and rungs as usual. Replace the ambiguous node dots with terminal block symbols, since your power rail is actually made up of terminal blocks; not solder joints, wire-nuts, or a daisy-chain of wire. Open the Create/Edit Wire Type dialog and add a new wire type named JUMPER or JUMPER-BAR if you prefer. 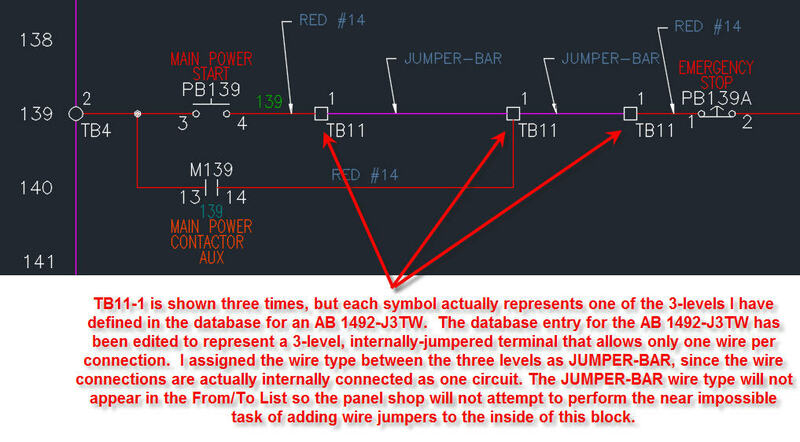 Use Change/Convert Wire Type to assign all segments of wire between the terminal block symbols to the layer named JUMPER or JUMPER-BAR. This takes care of the schematic portion of the power bus. Easy isn't it? The JUMPER or JUMPER-BAR layer will still be considered a current carrying conductor, as it truly is, and will even pass along the wire number (a.k.a. node number) to other connected devices. But it will not appear in the From/To List as a wire that must be connected. 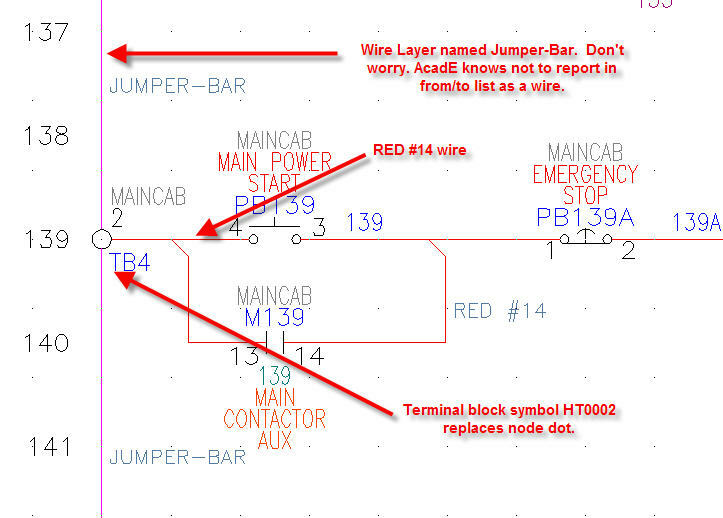 Note: AutoCAD® Electrical is programmed not to include a wire type (layer) with the word JUMPER anywhere in its name when it creates a wire From/To List. The illustration below shows the JUMPER-BAR layer assigned to the vertical rails (shown in magenta color). Use any color that would not be confused with your wiring standard. I chose magenta since I have no magenta wires in the system. There you have it. The terminal strip in your panel layout appears the way it will appear in the actual panel. You can insert balloons as needed and since the jumper-bar symbol has an ITEM attribute it will be reported on the parts list (a.k.a. BOM) as a separate device. How to define a feed-through terminal block with 3 connection points, 2 on one side and one on the other side. Consider a terminal block, like the AB 1492-J3TW, which has 3 screw connections, 2 on one side and one on the other side. But it is really a series terminal, meaning that internally all 3 connections are one circuit. The database, as delivered by Autodesk, defines this terminal the same as the ones with 2 screw connections, allowing 2 wires per connection. But what if you want to allow only one wire per connection, as would be the case for a spring-clamp style block, like the Weidmuller 794742000 ZDU 6/3 AN BL terminal? Until Autodesk enhances the Terminal Strip Editor and the Terminal Properties database to accomodate this need, what I do is edit the terminal properties to redefine the block as a 3-level block, internally-jumpered, allowing one wire per connection, as shown below. I insert 3 terminal symbols into the drawing and connect them to one another with a wire layer named JUMPER-BAR, as shown below. I click on Add/Modify Associations to define each of these terminal symbols as represeting the various levels of one block. Terminal Strip Editor always shows two physical sides of a terminal, as left and right, simply because that is how the interface dialog was designed. At the time it was designed, there was no consideration of spring-clamp terminals where there could be 3, 4, or 5 wire connections, all pushed in from the top. In this case I will discipline myself to only show wires connected to one side of the terminal. I am effectively ignoring the right-hand side of the interface, pretending that it doesn't exist. Note: There is a request posted to the idea station to enhance the TSE interface to allow us to define the maximum number of wires for each individual connection, left and right. Please vote for this idea at http://forums.autodesk.com/t5/autocad-electrical-ideastation/terminal-properties-database/idi-p/5431759 if you would like to see it implemented. I would envision the terminal properties and the TSE interface could be enhanced such that we could define the number of wires per connection for each connection, left and right, and thus the interface would gray out the areas where no wire could be connected. Starting with version 2009 of AutoCAD® Electrical you can assign an item number to parts listed in the Multiple Catalog list for a component symbol. Take for example a 1794-TB3 terminal board for A-B Flex I/O modules. This part may appear as a multiple catalog item under several "master parts", such as 1794-IB16, 1794-IR8, etc. 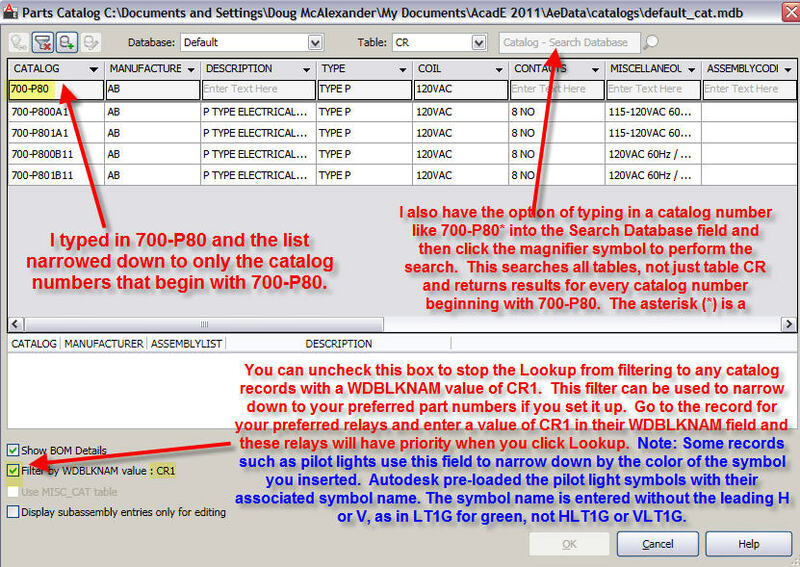 AutoCAD® Electrical 2009 normally displays all Multiple Catalog items beneath each master part they are associated with. 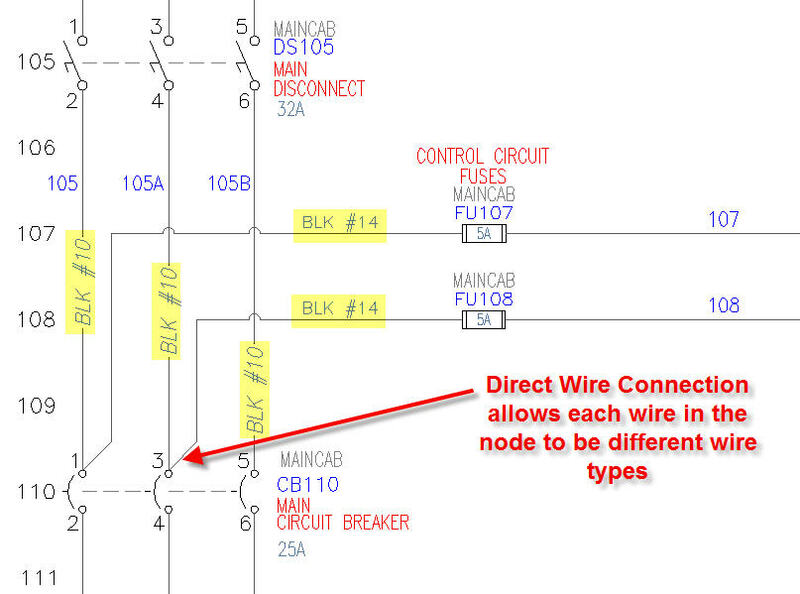 This is because AutoCAD® Electrical is reasoning that you want to see all components associated with each unique component Tag. But with a Tallied Purchase List Format you prefer a simple sum total tally of all parts, according to item number. You would not want to see 1794-TB3 listed in the BOM more than once, under each Flex I/O module. In fact you only want to see each Item number listed once on the BOM. AutoCAD® Electrical 2009 and 2010 will list each subassembly part beneath its master, even if you select a Tallied Purchase List Format. For example if the 1794-IB16 is item number 76 and the 1794-TB3 is item number 77, entered into the Multiple Catalog list for the 1794-IB16, you would see them listed together, and that would seem right. But then your 1794-IR8 might be item number 78 and in its Multiple Catalog list would be item number 77 again, because the 1794-TB3 is listed as a Multiple Catalog part under the 1794-IR8 as well as under the 1794-IB16. I will share with you how I have gotten around this issue during the years that I have been using AutoCAD® Electrical. I have had this scenario with fuses and fuse holders, control relays and their bases and clips, and with such parts as the 1794-TB3 Flex I/O terminal board. 1. Insert a Generic Marker from the Panel Layout>Insert Footprint>Manual menu. A Generic Marker is basically a footprint with attributes, but no geometry. You will see the MFG and CAT attributes that you assign, but no geometry. Hint: You can manually type in the tag of the master part this item goes with if you want it to be a "surf-able" entity associated with the master part. I place the Generic Marker above or below by Flex I/O footprint. The footprint looks like a Flex I/O module plugged into a 1794-TB3 terminal board. So the master part number is assigned to the footprint. I then insert a Generic Marker above or below the Flex I/O footprint and assign MFG as AB and CAT as 1794-TB3. I manually type in the Tag assignment of the master that this 1794-TB3 is associated with. The quantity should be 1. Be sure to assign an Item Number. I will insert a Generic Marker next to each of the Flex I/O footprints. Each will have a different Tag assignment but will carry the same MFG, CAT, and ITEM assignment. This will result in one sum total listing for all 1794-TB3 boards, regardless of the master part they are associated to. In the image below you see a Generic Marker located directly above the Flex I/O module. What appears to be simple text is a fully functional, non-graphic, footprint which captures the MFG and CAT to order the 1794-TB3 terminal board for the Flex I/O module directly beneath it. 2. This method is "real-world". You think of your panel footprints in pieces. 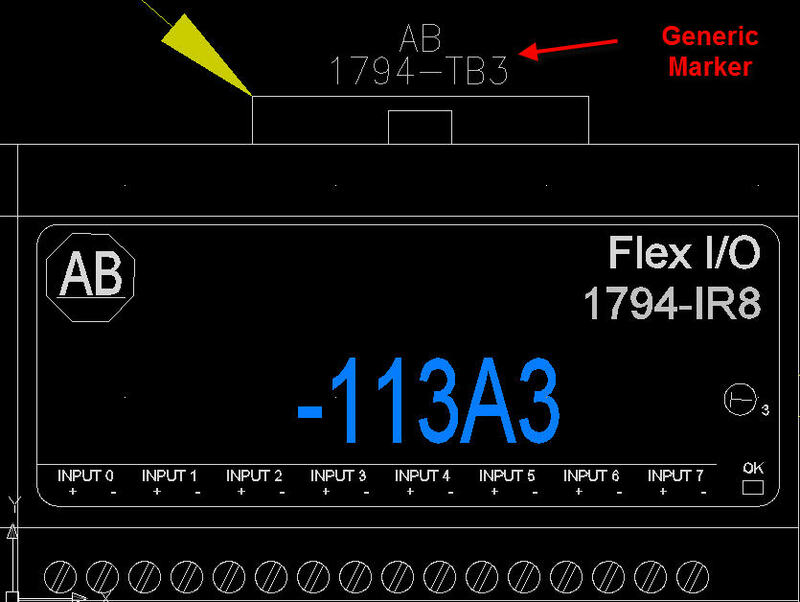 For example, the 1794-TB3 is installed in the panel and the 1794-IB16 is then plugged into it. In the case of a control relay, you install the relay base, then the relay, and finally the clips. So with this method I actually create multiple footprints, each with a complete set of Panel Footprint Attributes. They are inserted one on top of the other, as if I were the panel shop technician installing the components. So in the case of the Flex I/O and its terminal board I split the Flex I/O footprint into two separate blocks, one to represent the 1794-TB3 terminal board and the other to represent the module. I use a common base point for each footprint block so I can overlay them accurately. I usually insert the base device using the Browse feature on the Panel Layout>Insert Footprint menu. I list the Flex I/O module in the footprint lookup database so it is inserted using the Insert Footprint from Schematic List function on the Panel Layout toolbar. 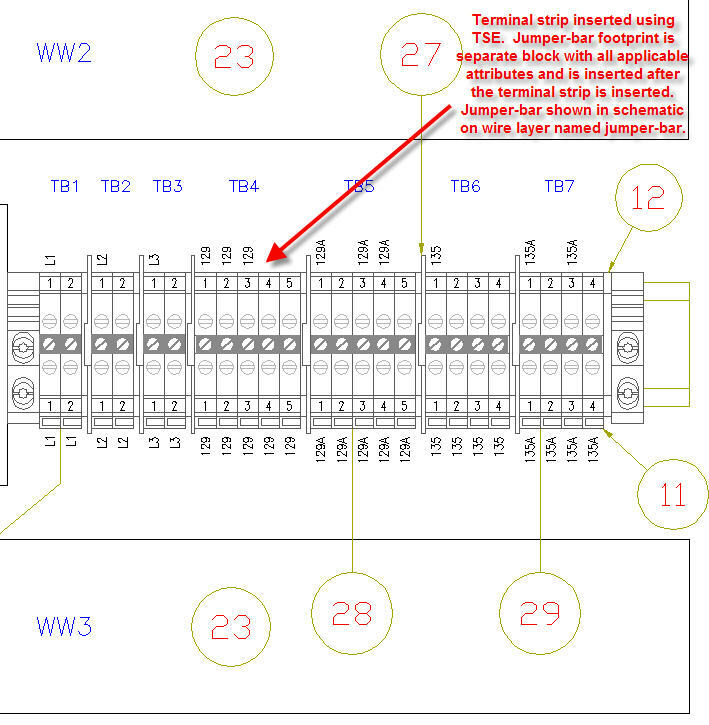 In other words, the actual part number that is common to both the schematic and the panel layout is the 1794-IB16 so this is the one I enter into the Footprint Lookup database. But the terminal board will only appear in the panel layout, so it gets inserted as a separate footprint using the Browse button. You can insert the terminal boards before inserting the modules (if you know how many you need), or you can insert the terminal board after you have inserted the module footprints. Below is an example using method 2 to insert the three parts that make up a control relay, each with its own set of attributes, so each can be assigned a separate item number. In this scenario, the bases were inserted first, then the retainer clips, using a common insertion point. Finally the relay coil was inserted from the Schematic List. 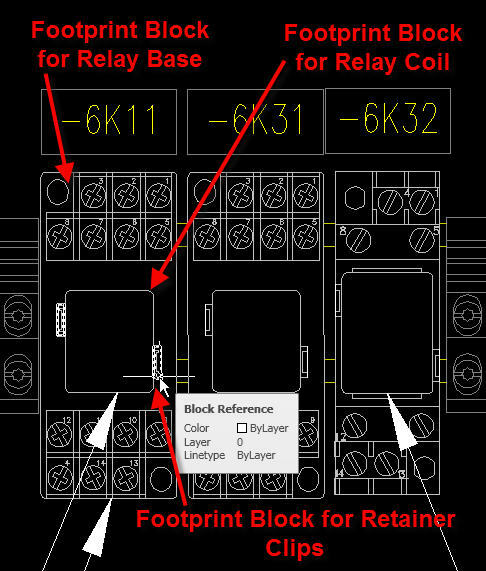 To link the relay with the base and retainer clips I just copy and paste the relay coil's TAG into the TAG field of the base footprint and retainer clips footprint, either using the Edit Footprint tool or Enhanced Attribute Editor. You can use existing "dumb" footprint blocks "as-is" if you wish. AutoCAD® Electrical has a group of blocks at the root level of the Panel folder that contain various types of attributes, according to the type of component the footprint represents. Use the Footprint Database File Editor to associate your footprint with the MFG, CAT, and optional ASSYCODE combination that should trigger insertion of this footprint. When you choose this component using the Insert Footprint from Schematic List method AutoCAD® Electrical will merge the appropriate block from the Panel folder into the footprint on insert, so the attribute data from the schematic symbol will have a bucket to be dumped into. When AutoCAD® Electrical resorts to this "merge-in" method the attributes are inserted at the base point of the footprint. You can use the Move/Show Attribute command to reposition the attribute(s). Below is an example of a contactor footprint block that has no attributes. 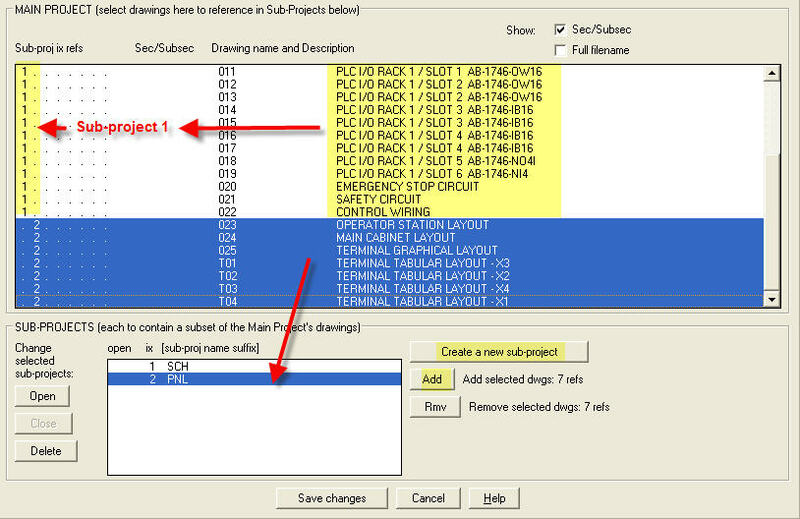 During the Insert Footprint from Schematic List process AutoCAD® Electrical added the needed attributes using the "merge-in" blocks from the Panel folder. If you want to avoid the merge-in method, use the Symbol Builder to pre-load and pre-position the attributes. 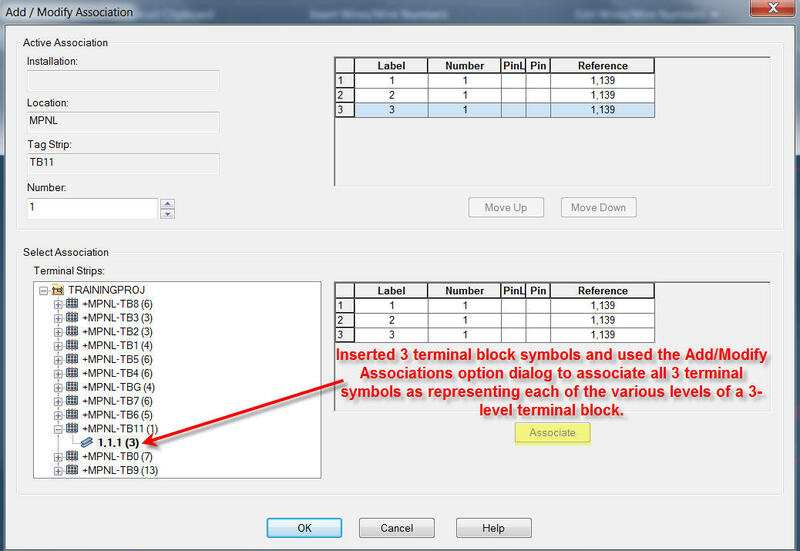 The Symbol Builder will provide a list of appropriate attributes commonly used in footprint blocks. The footprints in the image below were created or modified with Symbol Builder and contain the appropriate AutoCAD® Electrical compliant attributes, each in a predetermined location. 3-pole fuse symbols inserted from the Icon Menu use a special command trigger called wd_3unit. This command trigger actually inserts a "parent" fuse symbol (i.e. HFU1) followed by two "child" fuse symbols (i.e. HFU2, adapting to virtually any wire spacing. Electrical then automatically joins the three separate fuse symbols together with a dashed link line to give the appearance of a 3-pole fuse. Disconnect Switches and Circuit Breakers are handled much the same way. This is appropriate because the other two poles of a circuit breaker or disconnect are actually molded into the same package as the first pole. However, the difference between a 1-pole fuse and a 3-pole fuse is the fuse holder. Each of the 3 fuses are therefore represented by a parent symbol, which includes the MFG and CAT attributes needed to store the catalog data. We cannot edit the Footprint Database and create a permanent relationship between one fuse part number and separate 1-pole, 2-pole, and 3-pole footprints. So how do I handle this? The following is a brief expanation of how I teach this in my Admin-level Training course. I have the class use one fuseholder footprint that includes the graphic for a single fuse and its fuse holder, just as they would appear together in the panel. In the Footprint Database, I have the class create an entry for the fuse part number that calls up this single pole footprint. What I teach the class to do is select all 3 fuses at once when they insert from the Schematic List to their panel layout. Next I have the class use the Uniform Spacing option and specify the left-to-right spacing between each footprint symbol so the three fuse holder footprints insert next to one another, yet appear as though they are one 3-pole fuse holder. With this approach one footprint suffices for all three fuses, yet it appears as though it is a 3-pole fuse holder. This same approach will work for 2-pole fuses. So how do we enter the part number for the 3-pole fuse holder? In our class project we add the 3-pole fuse holder as a Multiple Catalog entry for the first fuse symbol only and we do not allow the update to update the other two fuses. Bonus: Set the Project Properties for per-part-basis and you can assign a separate Item number to the fuse holder. The balloon insertion tool will detect the fuse holder and its Item number assignment and insert an additional balloon. Note: Be sure and select the first fuse footprint for balloon, the one with the fuse holder entry, so both item numbers are detected. 3-pole device symbols inserted from the Icon Menu use a special command trigger called wd_3unit. This actually inserts a "parent" symbol (i.e. HCB1) and two "child" symbols (i.e. HCB2, adapting to virtually any wire spacing. Electrical then automatically joins the three separate symbols together with a dashed link line to give the appearance of a 3-pole device. Disconnect Switches and multi-pole Fuses are handled much the same way. You can use the wd_3unit command trigger to create 4-pole, 5-pole, etc. symbols, but you must enter the parent name and each necessary child. 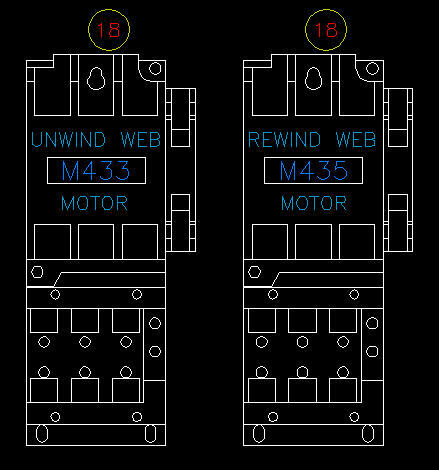 The wd_3unit command trigger only needs the name of the parent symbol to insert a 3-pole device symbol. It then searches the active library for the same symbol name as the parent symbol, but with a "2" as the 4th character of the symbol name, instead of "1". It inserts two of these child symbols onto the next available wires or rungs in the direction specified by the user, thus dynamically adjusting for virtually any wire or rung spacing. 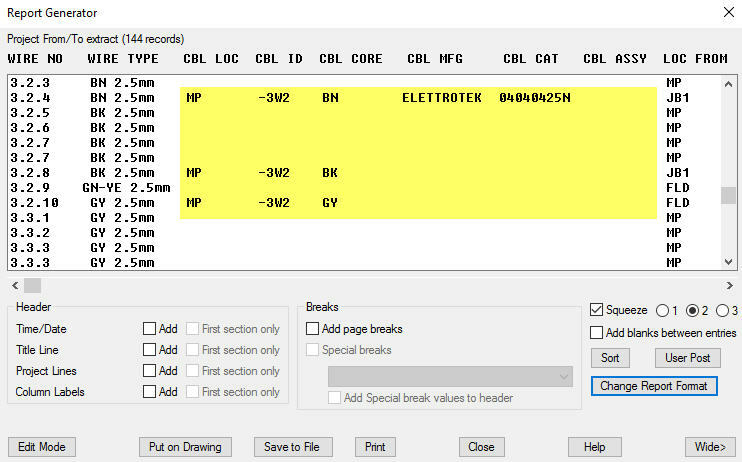 If you want to add a 4-pole circuit breaker to the menu, click on Icon Menu Wizard from the Other Tools panel of the Schematic menu tab. Select the library you wish to edit. Navigate to the Circuit Breakers and Disconnects submenu. Click on the button labeled Add at the top right-hand side of the Icon Menu Wizard dialog and choose the Command option. Type in a name (i.e. 4 Pole Circuit Breaker). Hint: You can create an icon image from a previously inserted 4-Pole Circuit Breaker that was perhaps inserted as a 3-pole with a 2nd+ child symbol added afterwards. You might also just leave the icon image field blank and wait until you insert your new 4-pole symbol. You can always come back to the Icon Menu Wizard, right-click on your 4 Pole Circuit Breaker symbol, select Properties, and edit it to add an icon image by zooming to the inserted symbol on your drawing. Finally, you need to enter the wd_3unit command trigger code. If you want the wd_3unit command trigger to insert anything other than one parent and two children, you will need to specify the parent and each child. In the field labeled Command type in wd_3unit HCB1 HCB2 HCB2 HCB2 (see image below). Click OK to save and exit the Icon Menu Wizard. Insert your new 4 Pole Circuit Breaker. The wd_3unit command trigger will prompt you for the insertion point of symbol HCB1 (VCB1 if on vertical wires), then it will prompt you for the direction in which it should look for wires for the child symbols. It will insert the 3 child symbols (HCB2 or VCB2) onto the next available wires, and all 4 symbols will ultimately be joined by a dashed link line. 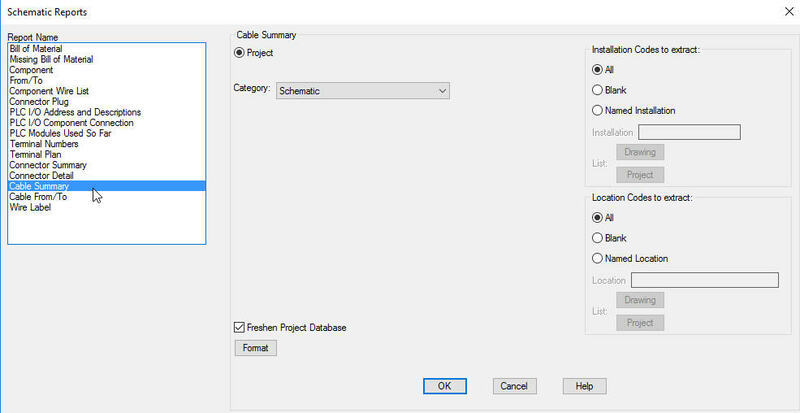 The parameters for inserting dynamically built DIN rails and wireways are stored in a spreadsheet file located in the Catalogs subfolder. The file is named wddinrl.xls. Autodesk, Inc. ships the software with a few preloaded DIN rails and wireways, but you can add your favorites to the list. 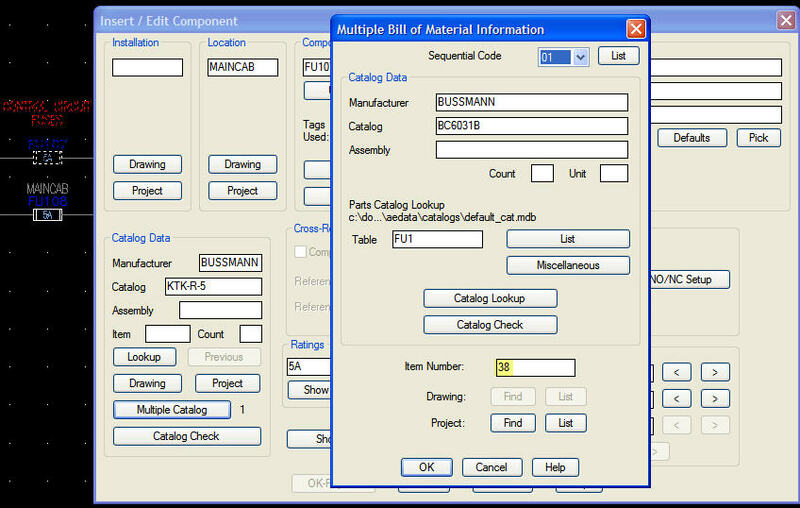 To add a new wireway, copy an existing one and change the value of the MFG, CAT, ASSYCODE, DESC, and RAILWID cells. The screen image below shows where I added two Thomas and Betts wireways. HINT: Add additional DIN rails using the same method but be sure to edit the extra cells for rail length, rail center, slot locations, etc. To share AutoCAD® Electrical design files with other users over a network simply copy the AeData folder, and all its subfolders, from My Documents\Acade 2011 (or whatever version you have) to your network drive. Next, right-click at the command line prompt and select Options. Add this new network path to the Support File Search path and move it to the top. Exit AutoCAD® Electrical. Note: It will be necessary to rename the local AeData folder on all of the computers in your group to prevent AutoCAD® Electrical from using the original. Even though you add the new path to the AeData folder on the network to the top of the Support File Search Path, AutoCAD® Electrical will still use the original AeData folder located in My Documents path if found. I usually rename the local one to AeData_Local. In the case of a laptop that you travel with, you can rename the AeData_Local folder to AeData again when you travel and no longer have access to the network. Hint: Be sure to keep your local libraries and databases up to date with the ones on the network, so you have the latest data. You can simply copy the files from the network folders to their matching local folders and overwrite. Another option is to remove the language folder path from the Catalog Parts Data Path in the WD.ENV (Wiring Diagram Environment) file. %WD_DIR% is a shortcut that the software uses to represent the AeData folder. When you placed the AeData folder on your network drive and added the path to the top of the Support File Search Path you redefined the value of %WD_DIR%. The shortcut %WD_LANG% represents the language folder (i.e. en-US). When you place the Catalogs and PLC folders directly under AeData, you can remove the %WD_LANG% entry in the environment file and AutoCAD Electrical will find them inside of the AeData folder. 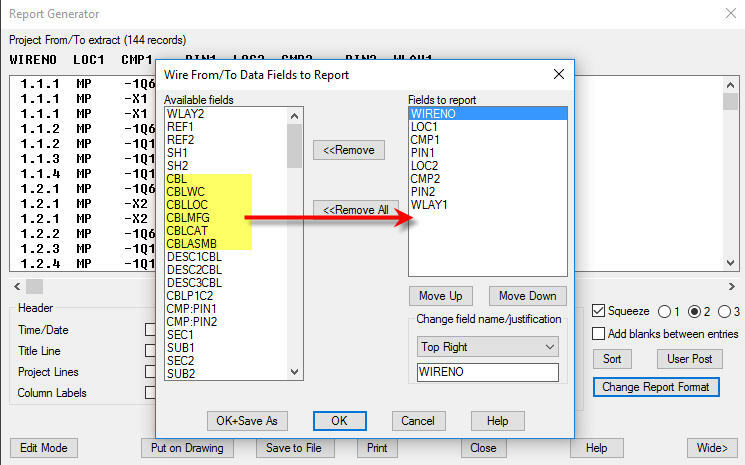 Since the path to AeData is listed first in the Support File Search Path, AutoCAD Electrical will find the Catalogs and PLC folders on the network before it will attempt to find them on the local drive. What about the symbol library folders? You could copy the Libs folder and all subfolders (i.e. JIC125, IEC2, Panel, etc.) to the network. The key is your project properties. Right-click on project properties and set the library paths for schematic symbols and panel footprints to your network path. AutoCAD® Electrical will then find everything it needs. I prefer to keep the stock symbols on my local drive for faster access. For custom schematic symbols create a network folder called Custom Symbols or something similar. If you moved the JIC1, JIC125, NFPA, IEC2, IEC4, IEC60617, panel, etc. library folders to the network I suggest placing your Custom Symbols folder in the same location as the other library folders. Store any schematic symbols that you create or modify in the Custom Symbols folder. Hint: If you are compelled to modify any of the stock AutoCAD® Electrical symbols, the ones in the JIC1, JIC125, NFPA, IEC2, IEC4, IEC60617, etc. folders, do not change the original symbol file. Copy the original symbol file to your Custom Symbols folder and change it there. DO NOT rename it. Keep the name the same but always put your Custom Symbols folder at the top of the project's schematic library path. 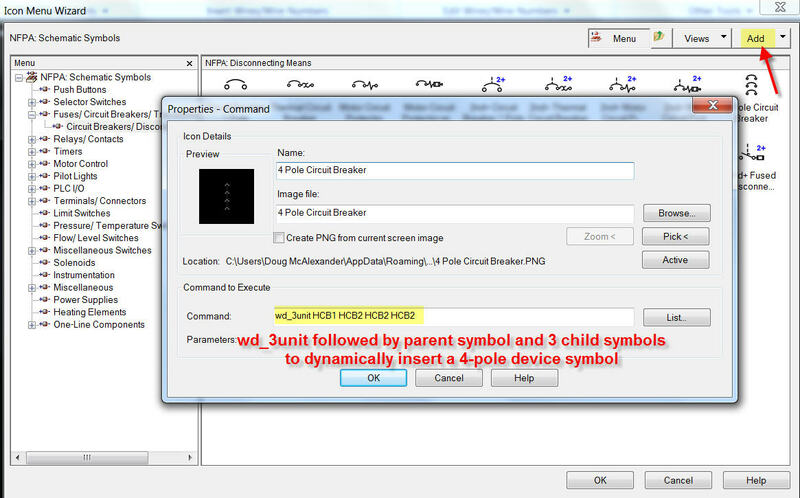 That way if you have a modified version of a stock schematic symbol, AutoCAD® Electrical will find the one in your Custom Symbols folder before it looks in the JIC125, IEC2, etc. When you copy projects, the library path statements copy with them, so you will only need to set this up once if you always start a new project from an existing one. For custom footprints, create a folder inside the Libs\Panel folder called Custom Footprints. When you create a new footprint, store it in this custom folder. Go to the Footprint Database File Editor and simply enter the path to your footprint under the MFG and CAT entry for an existing part, or add a new MFG and CAT entry with the path to your footprint. 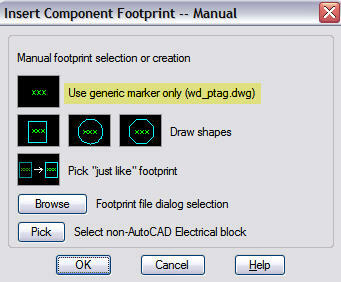 Hint: You can use existing footprints that you have made with plain AutoCAD if you wish. Even if they do not have the proper attributes for AutoCAD® Electrical compliance, AutoCAD® Electrical will merge some blocks it has stored in the panel folder to add the attributes it needs, on-the-fly. These attribute blocks insert at the base point so you may need to move some of the attributes around after insertion, using the Edit Attributes tool. If you want a permanent location for attributes in footprints you use repeatedly, consider using the Symbol Builder to add the appropriate footprint attributes permanently to the blocks. As a bonus you can edit the WD.ENV file to automatically point to your Custom Symbols and Custom Footprints folders when clicking the Browse button in the Insert Component or Insert Footprint dialog boxes. Also, by setting this path, the Symbol Builder will default to these locations when saving a new symbol that you create. You can also choose to share the Menus over the network. As a new symbol is created and added to the menu everyone on the design team will see this addition the next time they click to access the Icon Menu. Create a folder inside of the networked AeData folder and name it Menus. Edit the WD.ENV file to point to this networked Menus folder. Copy the MENU.DAT files and their related .SLB and .DLL files to this folder. They are located inside the Support folder that is one level above your local User folder. Inside of this folder, also copy the Images folder, where the Icon Menu icon images are stored for symbols you created with Symbol Builder. The Images folder gets created automatically the first time you create a block with Symbol Builder and save an icon image for the menu. If you haven't yet created a custom symbol, you can simply create the folder inside of the Menus folder that is inside of the AeData folder on your network and it will be awaiting your first symbol creation. Do not confuse the Images folder with the Icons folder. The Icons folder is where icons are stored for any additions you make to the Ribbon menu, and this folder should remain on your local drive. Hint: You do not have to use the icon image that was created by Symbol Builder. In fact, those icons are very minimal and lacking in detail. You could download an image from the Internet or use the Windows® Snipping tool to snip an image from a web site. Be sure to save the image as a .PNG (Portable Network Graphics) file. NOTE: I recommend against changing the entry in the WD.ENV related to the location of the slide library files. There is an issue within the software that causes it to lose its connection to the bitmap images it uses for the Insert Ladder, Fan-In/Fan-Out, Multiple Bus dialogs, and other dialogs that include an image. The bitmaps are stored at C:\Program Files\Autodesk\AutoCAD 2016\Acade by default, and this is where the software looks for them. If you do decide to enter a network path for the slide library files, then you must copy all of the bitmaps from the C:\Program Files\Autodesk\AutoCAD 2016\Acade folder to the same network folder where you moved the menu .DAT, .SLD, .SLB, and .DLL files. The Icon Menus for symbol insertion will still function from the network location without a redirect in the WD.ENV file, as long as the .SLB and .DLL files are located in the same folder as the menu .DAT files. I posted a request on the Idea Station for this issue to be corrected. If you would like to vote for this idea, so it gets moved up in priority, click on the link below and click the Vote Up button. You might want to consider sharing Report Format (.SET) files and Report Grouping (.RGF) files. You may have guessed by now that you need only to create a Report Formats folder inside of the shared AeData folder and define this path in the WD.ENV file as shown below. If you wish to share drawing templates (highly recommended), create a folder on the network drive , inside the AeData folder and named Templates. 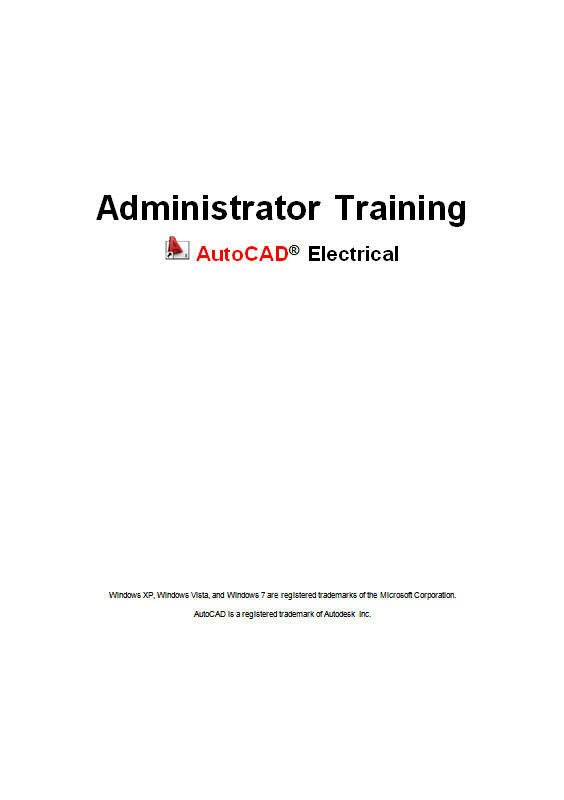 Place your prepared AutoCAD Electrical template(s) in this folder. 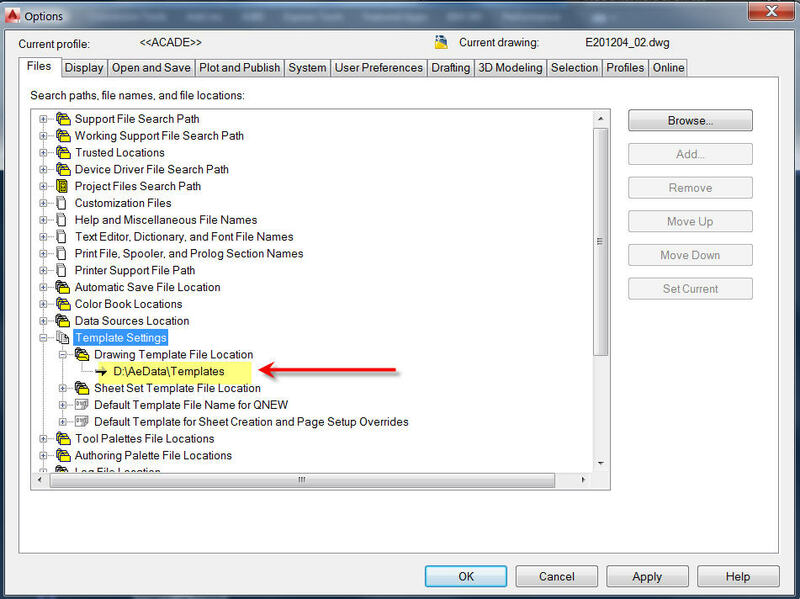 Open AutoCAD® Options and set the template path to the networked location. Note: This will become the default location where the software looks for templates so be sure copy all relevant templates that you will use into this folder, especially the acad.dwt file. This is the template that AutoCAD® uses to create a new drawing when you click the Quick New button. If you wish to share Saved Circuits, consider adding a folder inside of the AeData folder named Saved Circuits. Define this path inside the wd.env file, so AutoCAD® Electrical will default to this folder when you save a circuit, rather than the local User folder. Consider also sharing External Lists. Be sure to define these alternate paths in the wd.env file. Since the wd.env file is shared via the AeData folder all changes will be propagated to the rest of your design team the next time they start AutoCAD® Electrical. 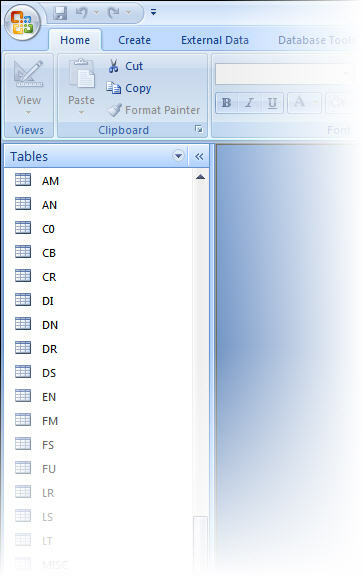 Below is an example of a folder structure that shares virtually all relevant data. These Family Codes correspond to the table names found in the default_cat.mdb database file. 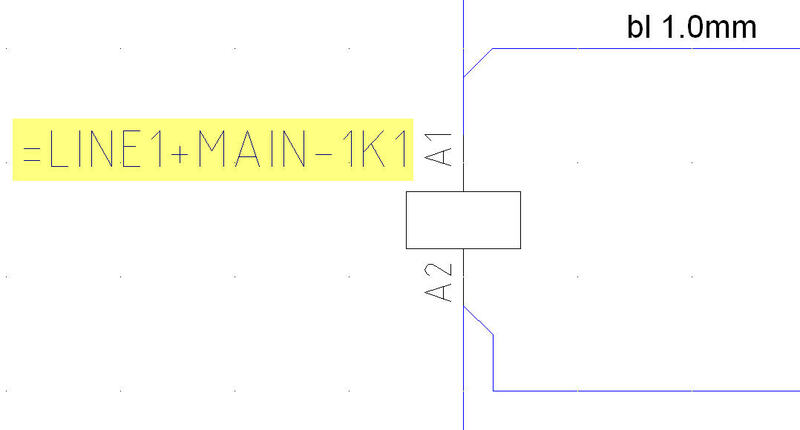 When you click Lookup to assign a part number to a component, AutoCAD® Electrical looks at the 2nd and 3rd character in the edited symbol's file name (a.k.a. block name) and opens the corresponding table inside the catalog database. This is the first level of filtering used during a part number assignment Lookup. AutoCAD® Electrical allows you to insert a PLC parametrically, as one complete symbol, or you can choose to break the PLC up into smaller sections, even as small as one I/O or terminal point per insertion. The PLC modules are defined in the PLC database. There are 40 symbol blocks available for each PLC style. These blocks are inserted in order, top to bottom, as defined in the PLC database. There are blocks for the module information, inputs, outputs, terminal points, unused connections, etc. Usually, no more than 3 to 5 blocks are needed to compile a parametrically built PLC. The inputs will most likely be the same block used multiple times. For example, you will usually start with a Module Information Block, which can also be an Input, Output, or Unused wire connection. Next you define the rest of the I/O points, usually the same block for each, and finally terminal points for the power connections. The image below illustrates an Allen-Bradley 1746-IB8 PLC input module that is built using 3 of the 40 blocks available for whichever style is defined in Drawing Properties. At the top is a block that will display module information and includes the first input point with wiring expected from the left. This is followed by 7 additional inputs with wiring expected from the left. And finally, there are two terminal points for ground/return with wiring expected from the right. After all of the defined blocks have been inserted, these individual blocks are automatically compiled into one block. Consult AutoCAD Electrical Help for instructions regarding the full use of the PLC Database File Editor, or attend one of my advanced training courses, where we add a completely new module to the database, including how to pre-define break points, spacing, and unused terminal points. 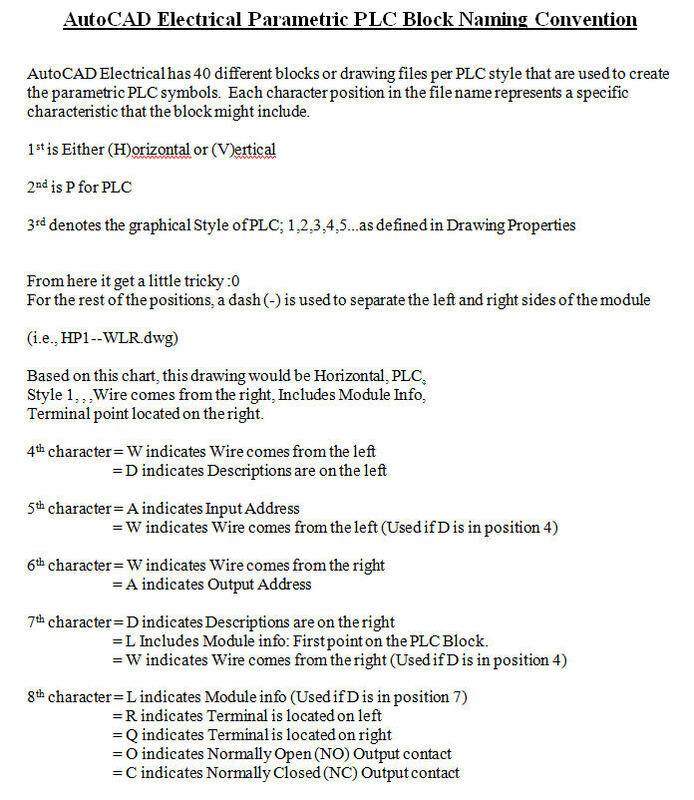 The selections you make as you define the PLC, from top to bottom, correspond to AutoCAD® blocks that are located in the symbol library that your project is set to use for schematic symbols. The file naming convention used for the blocks is based upon the type of block, corresponding to a specific graphical look, and specific attributes, depending upon whether the block represents a module information block, input, output, unused, terminal point, etc., and whether the wiring is expected to come from the left, right, or both. There are 200 blocks total, 40 for each PLC graphical style. Below is a breakdown of the block naming convention. The "?" is replaced by whichever PLC graphical style you choose to use, as defined in Drawing Properties. Click Here View/Print a PDF which outlines the seps involved to convert a promis-e project so it is compatible with AutoCAD Electrical. Note that this utility only converts legacy promis-e projects, prior to version V8i. 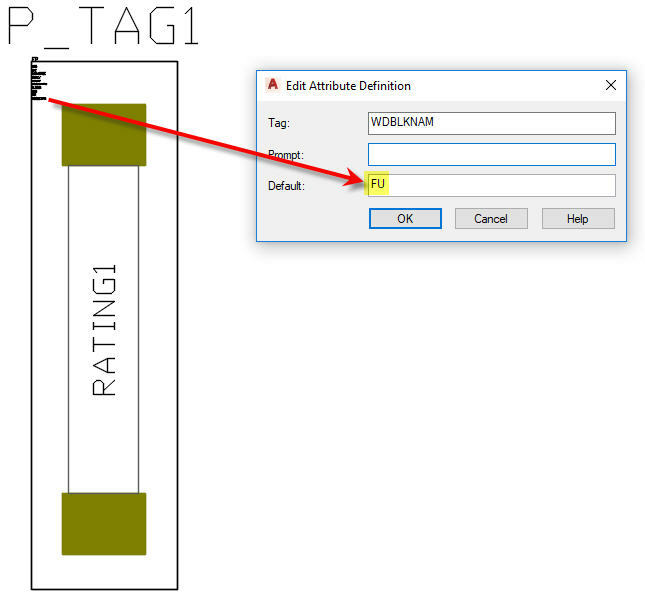 Without the IEC tag mode (Combined Installation/Location tag mode) engaged the Electrical Audit routine in AutoCAD® Electrical would detect two terminal strips tagged as TB1 and two disconnect switches tagged as DS1 and report an error. But with IEC tag mode engaged Electrical Audit correctly interprets these as two separate terminal strips and two separate disconnect switches because it considers the Installation and Location values as part of the component tag. Hint: Check the box next to the option labeled "Format Installation/Location into tag" if you wish to have the Installation and Location codes appear in line with the tag. If so I suggest using brief abbreviations for the INST and LOC codes. For example =LINE1+MAIN-1K1 indicates an Installation of LINE1, a location of MAIN, and relay K1 on sheet 1. This is typical IEC tagging. The equal sign (=) denotes Installation code, the plus sign (+) denotes Location code, and the dash (-) denotes component tag. 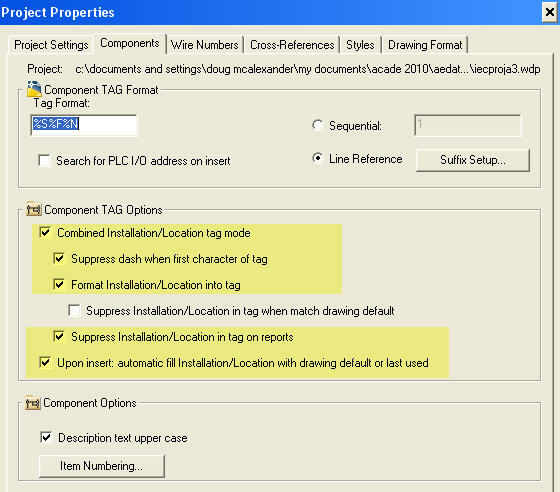 Typical IEC drawings are assigned a default Installation and Location code that appears in the title block of each drawing/page. It is understood that all components on the drawing are in this Installation/Location unless otherwise noted. The exceptions are usually surrounded by a dashed box called a Location Box in AutoCAD® Electrical. 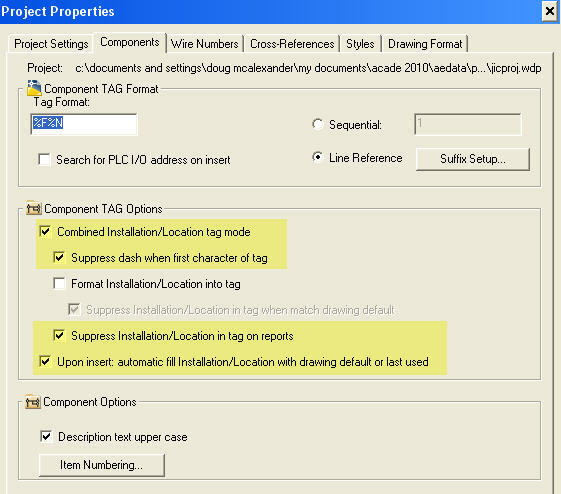 If you prefer to suppress the Installation/Location portion of the component tags that match the drawing/page defaults, check the box labeled "Suppress Installation/Location in tag when match drawing default". I travel across America and other parts of the world teaching AutoCAD® Electrical. I can tell you that, in general, the standard is no standard. I wish that were not the case. In Europe they follow an established standard called IEC almost to the letter, no matter where you go. However in America, it is as if no standards exist. I have seen control relays tagged as CR, MCR, R, RC, and a unique tag for each relay, according to its function in that particular machine. I've been using AutoCAD® Electrical since 1997. The JIC symbols in AutoCAD® Electrical appeared to inherit the most common tagging schemes seen around the U.S., most of which do match published standards, the chief being JIC. The Joint Industrial Council (JIC) dissolved by the 1980s so the National Fire Protection Association (NFPA) was asked to take over. The NFPA released NFPA-79 which incorporated the JIC standards with some updates. Note: AutoCAD Electrical release 2013 includes an NFPA symbol library. First let us understand that there was never an intention to supply an exhaustive symbol library with AutoCAD® Electrical or its predecessors. The JIC symbol set that shipped with the program was intended to serve as a sample of simple symbols in common use at the time. The developers never expected the sample symbols to be perfect for everyone. In fact it was expected that customers would add to and/or modify them according to their own preferences. The "Black Box Builder", later renamed to "Symbol Builder" was intended to be used for this purpose. The JIC symbol set is mostly limited to 2-wire devices, similar to the list of common symbols referenced in the standards. The user was expected to create their own application specific symbols, especially symbols with numerous wire connections, since the preferred orientation and location of the wire connections could vary from user to user. What you see with AutoCAD® Electrical, and its predecessors, is an attempt to supply the common building blocks of any control system, such as pilot lights, push-buttons, selector switches, fuses, circuits breakers, control transformers, terminal blocks, etc. With such common symbols the most commonly accepted tagging formats in use at the time were incorporated into the predecessor of AutoCAD® Electrical. While most of these class designations (a.k.a Tags or Device IDs) match the JIC standards there are some variations. I have coined the term technical colloquialisms when referring to these variances. For example, back in the JIC days some designers would designate a disconnect switch as "DS" while others would use "DISC", in accordance with the JIC standard. Some designers used "TD" to designate a time-delay relay while others would use the JIC designation of "TR". The class designation "D" was often used to designate a rectifier diode while the JIC standard called for a designation of "REC". Another example of a technical colloquialism is the term "wire number". It is actually an electrical "node" number or "potential" number. We have a colloquialism associated with ladders as well. Is it really a 1-phase ladder when you use L1 and L2? The term single-phase technically refers to a power source derived from a single "hot" phase and neutral. The developers were tasked with creating an electrical design tool that allows us to design highly sophisticated machinery, yet the tool itself must be as intuitive as possible so the designer doesn't lose himself/herself in learning the tool. Thus it appears that the developers chose to incorporate common terminology and common practices into the software, not an absolute adherence to a certain standard. Again, back in the days when AutoCAD® Electrical was created the standard practice in the U.S. was more of an "every man for himself" standard. Consider this: Where did we get the standard for using blue wire for D.C. control voltage? It is a “defacto” standard derived from the common practices at automobile manufacturers. Since automobile manufacturers were among the first to incorporate sophisticated control systems, their common practices became a “defacto” standard. Once in a while I run across someone who uses red for DC(+) and black for DC(-). Don't assume that the major corporations are following standards to a proverbial “T”. One of the oldest and most recognizable electrical companies, known throughout the world, uses component tags on a "circuit-function" basis. Note: This practice is actually allowed according to Annex E.1 of the NFPA-79 standard. Each time this customer inserts a symbol they manually enter its tag, according to the component’s use within the machine. Thus no two relays will necessarily have the same tagging format. One may be RM12 while another is TM42, and another is KC14. This approach makes use of NFPA-79 Annex E.1, where the class designation of the relay indicates its specific function within the circuit, and not the generic classification of control relay. I recommend including a legend page to define the component class designations for your circuit diagram, when you choose to deviate from the component class designations and opt for circuit function designations instead. In summation, I do not fault the developers of AutoCAD® Electrical with regard to symbol libraries. They could have chosen to release a common design tool and let us create our own symbols. They gave us the symbol builder tool just for that purpose. But they were also kind enough to give us over 1500 symbols in various orientations as a sort of “starter set” that we could use and tweak as desired. With this starter set of symbols they had to choose some default tagging scheme from the various ones that existed at the time. What they chose was mostly from the JIC standards but with a few variations, based upon common practices of the time. But we have the option to modify to our delight, either by changing the default in the TAG1 attribute of the symbol files or by using the wd_fam.dat ASCII file method. If you prefer, you can use the Symbol Builder to create your own symbol(s), just the way you want them to look, but be aware that deviating from established standards may create confusion for technicians who may one day need to troubleshoot your control system, and may also put you at odds with machine safety directives. The world is becoming more interested in not only national but international standards. 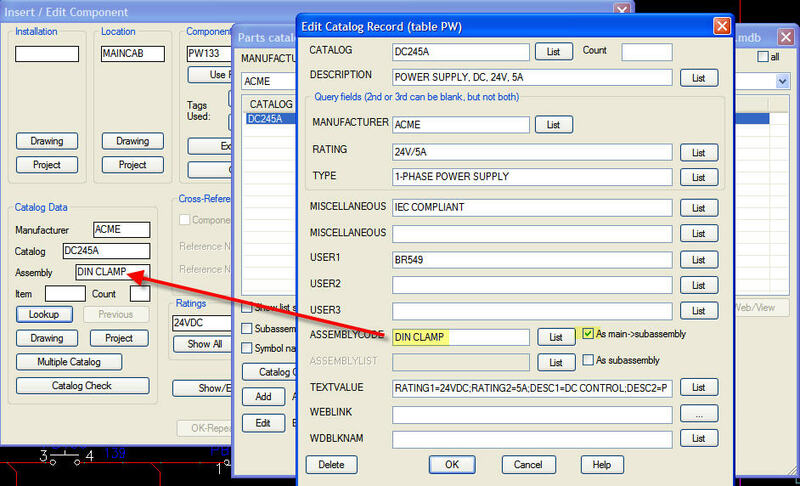 For example the IEC library that ships with AutoCAD® Electrical was developed a few years ago in accordance with IEC-60617, which governs the appearance of the symbols, and IEC/ISO-81346 (replaced IEC-61346), which governs the tagging format. But two owners ago, when AutoCAD® Electrical was developed, there were various published standards and even more common practice "defacto" standards in use in the U.S. I think If AutoCAD® Electrical had been developed in this decade we might have seen a more strict adherence to the most current U.S. symbol standards, like we see with the IEC symbols. It's funny to note that today, with the published ANSI-Y32.2 and IEEE-315 symbol standards clearly in place alongside the NFPA-79 and UL-508A safety standards, I can visit 5 companies and find 4 or maybe even 5 different "standards" in use in America. It seems to me that the "standards" are still in somewhat of a state of flux, with personal opinions or just plain "that's the way we've always done it" syndrome getting in the way. This is a general overview of various electrical design standards currently in use in the United States of America and other parts of the world. In the U.S.A. ANSI-Y32.2 and IEEE-315 address the schematic symbols used for electronic circuits and general electrical design, while NFPA-79 and UL-508A deal with the safety requirements for industrial machinery, which involves a different set of component class designations for the symbols, more closely resembling the JIC standard from the 1960s and 1970s. UL-508A deals directly with Industrial Control Panels while NFPA-79 addresses the entire machine. The Joint Industrial Council (JIC) dissolved in the 1980s so the National Fire Protection Association (NFPA) was invited to take over. The NFPA released NFPA-79 which incorporated the JIC standards with some updates. Your design must meet the safety requirements of NFPA-79 and UL-508A in order to obtain UL approval, just the same as CE approval will require adherence to IEC-60617, IEC-81346, IEC-60757, IEC-60445, IEC-60204, etc. IEC-60617, IEC-81346, IEC-60757, IEC-60445, and IEC-60204 cover industrial machinery design in Europe and other regions that now adhere to IEC (International Electrotechnical Commission) standards. IEC-60204 deals specifically with machinery safety directives, IEC-60617 governs the graphical appearance of the schematic symbols. IEC-81346 governs component class designations (i.e. K for relay, P for indicator lamp, etc.). IEC-60757 governs wire color abbreviations (i.e. RD for red, BN for brown, BU for blue, etc.). IEC-60445 specifies the wire colors used to denote L1, L2, L3, N, PE, AC control, and DC control. NFPA-79 and UL-508A are similar to IEC-60204 with respect to machine safety and control panel design. Additionally NFPA-79, along with its subsequent updates, includes a list of component class designations, which happen to be very similar to those used in the JIC standard that preceded it, but with some minor updates. ANSI-Y32.2 and IEEE-315 are similar to IEC-60617, dealing with the graphical look of schematic symbols, however they also cover the class designations for component tagging, a.k.a. device identification. ANSY Y32.2 and IEEE-315 have been slowly migrating toward a closer synchronization with IEC-61346 (now replaced by IEC/ISO-81346) for component class designations and IEC-60617 for symbol appearance, but significant differences still exist. The traditional ladder diagrams used to document industrial control systems in North America continue to favor the JIC/NFPA-79 symbols and component class designations. In my opinion, a complete adoption of ANSI/IEEE component class designations for industrial control panels in North America would lead to confusion for designers and technician who have a long history with ladder diagrams. As of today, the JIC/NFPA-79 standard is still very dominant in ladder diagrams and ladder diagrams are still very much the the "norm" for control schematics in North America. The latest IEC standard for component class identification, IEC81346-2, has introduced an optional 2-letter device class identification. The first letter comes from the main category (broad in scope), while the optional second letter serves as a type of "sub-classification" further defining the device. IEC81346-2 supersedes IEC61346-2, which superseded IEC61346-1. IEC61346-1 was based on the DIN standard from Germany. IEC61346-2 introduced changes such that devices, whether mechanical, electrical, pneumatic, or otherwise are classified, based more so on their physical properties rather than their function. IEC81346-2 includes a group of optional tables in case you wish to use the 2-letter classification. For example, instead of plain "Q" for a disconnect switch or main circuit breaker, it is "QB" for the disconnect switch (fused or non-fused) and "QA" for the circuit breaker. A motor starter or contactor is also "QA", as is a power transistor or thyristor. There are other sub-classes for "Q" but that is a sample of the more common ones. Pilot lights were "H" in DIN and early IEC but are now under the broad class of "P", for "presenting information." To use the two-letter code to further qualify the pilot light (signaling device) you would use "PF". Protective fuses still fall under the main category of "F", as do protective circuit breakers (i.e. branch protection). The two letter code would be "FC". Believe it or not, a microprocessor or PLC processor is "KF" under IEC81346-2, along with control relay, analog or binary circuit, optocoupler, electronic tube, safety logic module, and more. I personally prefer IEC61346-1, based upon the DIN standard. It is a well established standard with widespread use and it clearly defines the function of a device with only one letter. I think the International Electrotechnical Commission has outlived its usefulness and continues to make changes for the sake of change - just to appear busy. That is my humble opinion. I still see many, many drawings from Europe using the old DIN standard or IEC61346-1 component class identifiers. But even with IEC81346-2, I happen prefer the one letter identifiers. If you use AutoCAD® Electrical and wish to follow IEC81346-2 without the second letter, just reference IEC2 (2mm text height) or IEC4 (4mm text height) for your project library, instead of IEC60617, and employ a wd_fam.dat file in your project folder to alter the few symbols that still match IEC61346-1. We cover this in my IEC training course. Keep in mind that the electrical CAD software isn't the designer. We are responsible for designing to meet the required safety standards where the machinery will be installed. Compare AutoCAD® Electrical to a carpenter's hammer. The carpenter must know where and how to nail, but without the hammer the job would be more difficult and would take longer. Programs like AutoCAD® Electrical will support our design by offering appropriate symbols for either the U.S. or International markets. 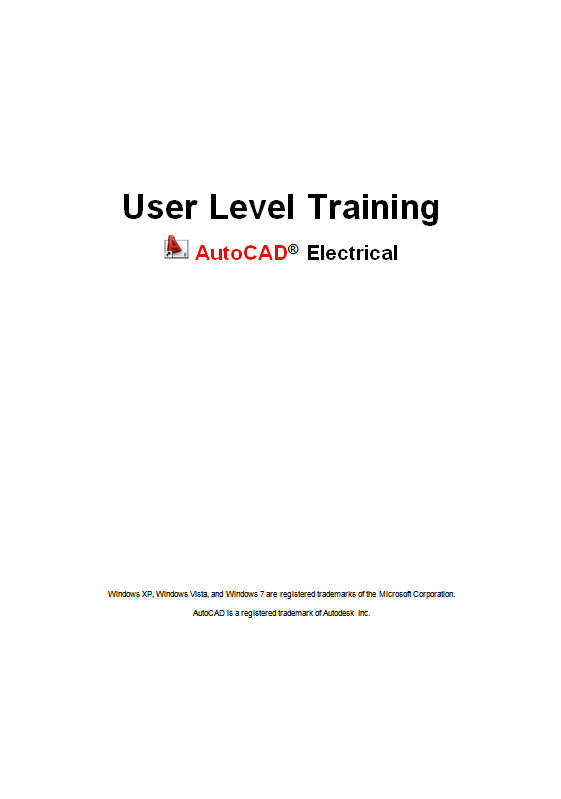 The JIC library in AutoCAD® Electrical is an appropriate symbol set to use for ladder diagrams, the dominant control schematic method in North America, while the included IEC library would have more International appeal. Click Here View/Print a PDF of a sample project designed to IEC standards, using AutoCAD Electrical. Note: The cross-references and tags are hyperlinked. If you hover your mouse over a cross-reference or tag and a hand symbol appears, click the left button of your mouse to surf the hyperlink to related drawing entities. It might be a relay contact, a footprint, a source or destination wire network, etc. If you use Google Chrome you must download the file and view with Adobe Acrobat. The Google Chrome PDF plug-in cannot process the hyperlinks properly. In this sample, the wires are identified based upon Sheet.Zone.1st, 2nd, etc. Wire numbers were not typically assigned to DIN and IEC projects in the past but as European designers desired to market their products in North America they found that North American customers like to use wire numbers (electrical node ID) as a troubleshooting aid. As European companies have adjusted their designs to meet the North American requirements, wire numbers have seen an increase in popularity in Europe. The makers of Electrical CAD software in Europe added the option for wire numbers many years ago, as they began marketing their software to the North American market and found that North American companies were not interested in an intelligent Electrical CAD program that could not assign and manage wire numbers. I have watched this trend since the 1980s and virtually every Electrical CAD platform on the market today offers some form of wire numbering. With a ladder diagram the component identification (tags) and wire numbers are usually based upon the line reference number (a.k.a. rung number). With IEC drawings the identification is usually based upon the sheet number and the zone or column where the device or wire is located. The drawing border in this sample contains both an X and Y grid, with a combination of letters (vertical) and numbers (horizontal). Though I only used the numerical zones for component/wire identification and cross-referencing, both the X and Y designations could just as easily have been employed. The cross-reference format follows IEC-61082. * User-level training assumes that your company already has personnel trained at administrative-level to support the user-level personnel. If you would like assistance learning and implementing AutoCAD Electrical, including training, implementation support, drawing conversion, or design support, please feel free to call Doug at (770) 841-8009, or send an e-mail to ECADConsultant@gmail.com. This site created and maintained by Doug McAlexander, Inc. Copyright © 2000-2017 Douglas R. McAlexander. All Rights Reserved.